Whenever a team opens a basketball season there is some "pressure" and expectation to start the campaign well. Add to this a heated county rivalry, a road affair in Mid-Southern Conference play and a series that dates back 133 games, you might be asking a little too much for a season debut. 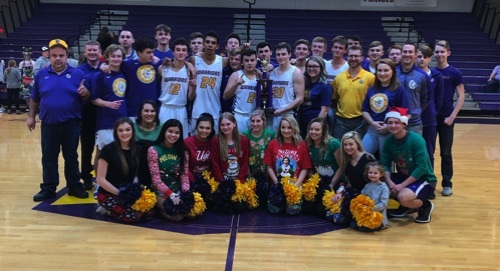 But that was the case on Wednesday night when in a packed Austin High School gym the visiting Scottsburg Warriors defeated the host Austin Eagles 80-76 in a pulsating affair that went right down to the final seconds. Junior swingman Nick Sebastiao led the Warriors with 25 points and freshman forward Hayden Cutter had 24 including 19 in a huge second half. The Eagles were led by sharp shooting senior guard Drew Buhr who had a game high 38 points including 21 in the first half. This 134th meeting of these Scott County rivals more than lived up to expectations. 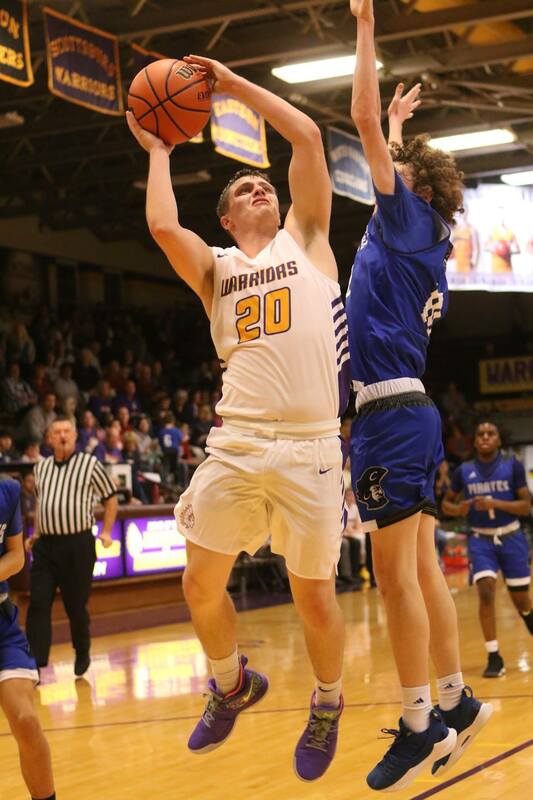 The game started off fast for both teams as the Warriors built a 11-4 margin before some full court pressure bothered Scottsburg as they took a 24-20 lead at the end of the stanza. Sebastiao had 12 points and Buhr 11 respectively to pace their squads. The second quarter saw Austin go on a 9-3 run to grab a 29-27 lead and they expanded that margin by as many as seven points, taking a 43-36 edge with 1:55 to go until the half. The Warriors however, closed with a flurry and trailed 43-40 at intermission. Austin outscored Scottsburg 23-16. Buhr continue his hot shooting with 10 points while the Warriors were led by sophomore guard Treyton Owens with five. The second half showed Scottsburg starting quickly on an 8-0 run to go ahead 48-43 with just under six minutes remaining in the quarter. Austin took the lead back 51-50 at the 3:05 mark before a pair of 3's and a lay in by Cutter gave the Warriors a 58-52 advantage. 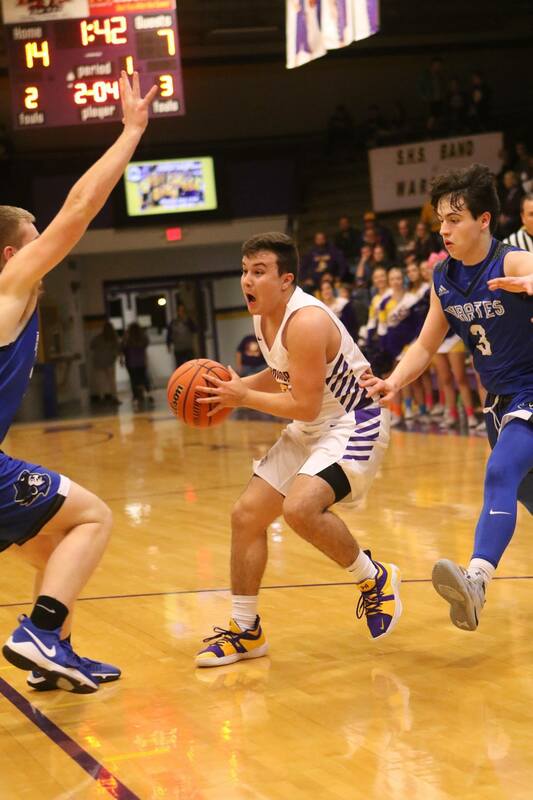 Austin responded with a three pointer and Cutter scored again on a lay in at the buzzer as Scottsburg took a 60-55 margin heading into the final period. The Warriors outscored the Eagles 20-12 in the third quarter as Austin had three 3-pointers and two free throws. Buhr was limited to five points while Cutter exploded for 11 on mostly strong post moves and Sebastiao had nine, including two trifectas. Sebastiao picked up his fourth foul early in the 4th quarter and after a trey by Buhr the Eagles trailed 60-58 with 6:49 to play. The Warriors led 70-65 after lay ins by Cutter and senior guard Mitchell Prince with just under 4:00. But the Eagles came right to tie the game at 70-70 near the 3:00 mark. Sebastiao reentered the game only to foul out moments later with the scored tied at 72-72. Austin took its last lead of the game after a pair of free throws at 74-72 with 2:31 to play. From that point on senior guard Jimmy Neace made a pair of free throws to tie the game at 74-74 at 1:55 to play and after the Warriors forced the Eagles into a turnover, Cutter converted on two more from the charity stripe to give Scottsburg the lead back at 76-74 with 1:48 to go. After an empty Eagles possession, Neace made one of two free throws at 1:29 to play before Austin made two free throws at the 1:00 mark to pull back within two points at 77-76. It would be that last scoring of the game for Austin. Senior guard Patrick Lincoln scored his only two points in the game coming with 35 seconds to play on a strong inside move after the Warriors fought off full court pressure from Austin. The most important possession of the game had Scottsburg taking a 79-76 lead. After a miss by Austin, Neace was fouled and made one of two free throws as the Warriors hung on for a 80-76 win. Austin outscored Scottsburg 21-20 in the final period. Neace had 10 points making three key free throws down the stretch. Prince had nine points, with six coming in the final quarter and was a huge key defensively while also distributing the ball inside getting his teammates say looks. Owens had eight points while sophomore guard Noah Smith scored two points. Lincoln's two points were arguably the most important of the game. For the game the Warriors were 16-26 from the free throw line and made six 3-point field goals. Buhr had seven two pointers and six trifectas to go along with six free throws for his 38 points. Senior guard Ethan Bequeret had 12 points for the Eagles. Austin made 11 three pointers and were 17-21 from the Charity stripe. Scottsburg, 1-0 overall and 1-0 MSC, plays at Eastern Pekin on Tuesday, Nov. 27 in another MSC encounter. Austin, 0-1 overall and 0-1 MSC, plays at Southwestern on Saturday, Nov. 24. 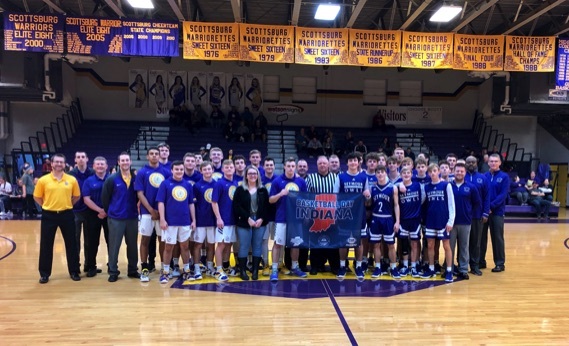 WARRIOR NOTES: This was the 100th victory in this rivalry for Scottsburg and the series now stands at 100-34 in favor of the Warriors and 20-8 in the past 30 years. 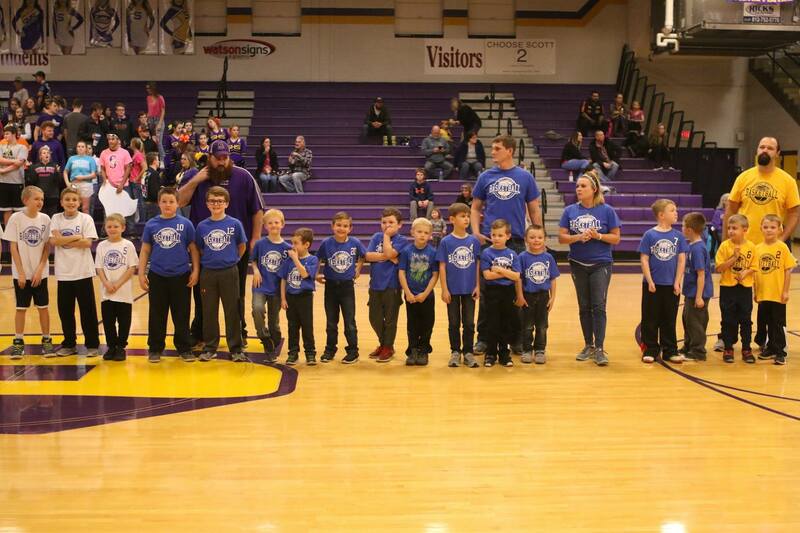 . . Scottsburg third year head coach Brent Jameson has never lost on the Eagles floor winning his opening MSC game there during the 2016-17 season; winning a Scott County Tournament game last December versus Orleans; and then Wednesday nights affair with Austin. All three victories went down to the final seconds. 3FG Shooting: Scottsburg 6-17, Austin 11-32. 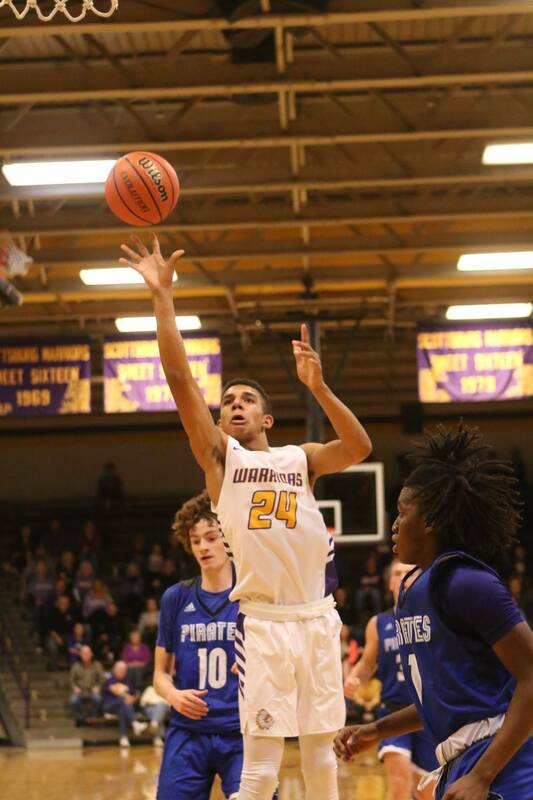 After a close road win last week against rival Austin, the Scottsburg Warriors boys basketball team felt like they needed to "tighten up" some things defensively heading into Tuesday's matchup with the Eastern Musketeers. The Warriors apparently did that and then some forcing numerous turnovers and defensive rebounds fueling their fast break, posting a 109-51 Mid-Southern Conference victory on the road in Pekin. The win moves Scottsburg to 2-0 overall and 2-0 in MSC play while the loss dropped Eastern to 1-1 overall and 0-1 in the MSC. Some six Warrior players scored in double figures led by sophomore guard Treyton Owens with 27. Senior guard Mitchell Prince had 17, followed by senior guard Jimmy Neace and freshman forward Hayden Cutter with 16; junior swingman Nick Sebastiao with 13 and sophomore guard Ryan Gibson with 11 points. Sophomore guard Noah Smith also contributed nine points. The Musketeers were led by junior guard Rhett Pennington who had game high honors with 29 points including nine three's setting a single game Eastern record. Pennington made five of his trifectas in the final period. "Our team really worked hard in practice to clean some things up defensively," said third year head coach Brent Jameson. "It showed in our transition offense off turnovers and rebounds as we were unselfish, looking for the open man. Treyton Owens had an excellent night not forcing his shot, getting into the flow and going hard to the basket. Jimmy Neace set the tone early defensively for us. Mitchell was steady as usual. All of our guys did an excellent job of getting a body on someone when rebounding, especially Nick and Hayden. Happy about the balance of our play and the contributions of some of our younger guys, such as Ryan Gibson and Noah Smith." The first quarter had Scottsburg holding a 14-7 lead at the 4:44 mark, and by the time the quarter was complete the Warriors had gone on a 17-5 run to take a commanding 31-12 edge as Owens scored 16 points. The second quarter had Scottsburg only allowing Eastern five points while scoring 23 and taking a 54-17 advantage into the intermission. Cutter paced the Warriors with eight points in the quarter. The third period had Prince hitting two trifectas early on as he would net 10 points in the stanza while Sebastiao went to work inside on the glass for nine. Scottsburg outscored Eastern 31-7 in the period as the Musketeers had two 3's by Pennngton and one free throw and didn't score a two-point bucket. The Warriors led 85-24 after three quarters. The final period was high scoring with Eastern netting 27 points behind Pennington's 17 point fourth quarter which included five three-pointers. Scottsburg had 23 to close out its 109 for the game. 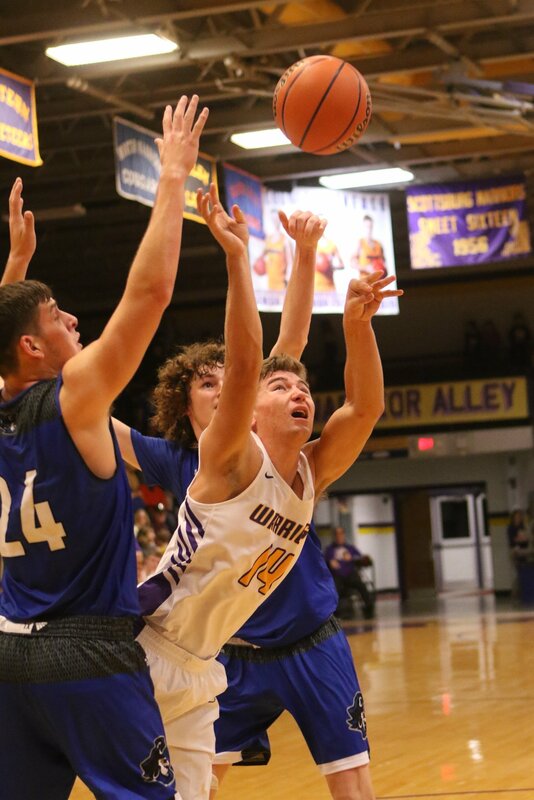 Scottsburg plays its home opener on Friday night, Nov. 30 at historic Meyer Gym against MSC foe Charlestown at 7:30 p.m. Eastern plays Friday, Nov. 30 at West Washington at 7:30 p.m.
WARRIOR NOTES: The 109 points was the first time Scottsburg has scored over 100 points since the 2004-5 season and most points scored since the 2000-2001 campaign. . .The Scottsburg junior varsity team upped its record to 2-0 with a 61-35 victory over the Eastern JV in the preliminary game. 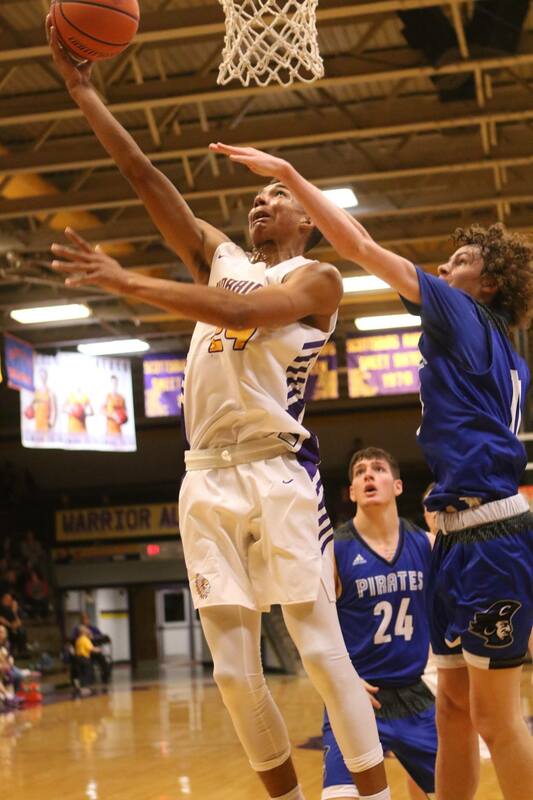 Utilizing defensive pressure and a balanced scoring attack, the Scottsburg Warriors made it three straight victories by posting a 63-46 Mid-Southern Conference decision Friday night against the Charlestown Pirates at historic Meyer Gym. 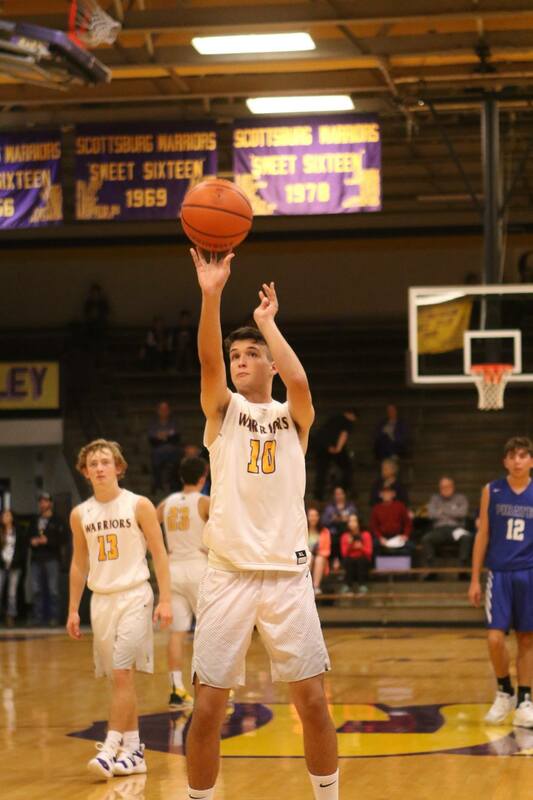 Freshman forward Hayden Cutter led Scottsburg with 19 points, and was joined in double figure scoring by senior guard Jimmy Neace with 16 including five three-balls and sophomore guard Treyton Owens with 12 points. The visitors were paced by junior guard Caleb Brown with 12 and junior forward Bo Braunecker with 11 points respectively. Scottsburg is 3-0 overall and in MSC play while Charlestown dropped to 1-2 overall and 0-2 in MSC action. "I was proud of our defensive effort," said Scottsburg head coach Brent Jameson. "Near the midway point of the first quarter until halftime we held our opponent to seven points. We weren't happy with our start in the second half but Charlestown made a strong run to get back into the game. I thought our team grew up a lot in this win to hold an opponent off and regain control of the game. Hayden was strong again inside and makes such good decisions when he has the ball. Jimmy has been shooting the ball fantastic. Overall a solid team effort." The "Pressure Cooker" lived up to its name as the Warriors held the Pirates to just 14 points in the first half, including a four-point second quarter. Charlestown opened the game with a 7-6 lead but then back to back three's by senior guard Mitchell Prince and Neace put the Warriors up 10-7 and gave them a lead they would never relinquish. Scottsburg would finish the first quarter on a 9-3 run, highlighted by sophomore guard Ryan Gibson's trifecta at the buzzer to give the Warriors a 19-10 lead. Owens and junior forward Nick Sebastiao both got buckets to start the second quarter and Charleston hammered a trey of its own to make the score 23-13 at the 5:20 mark, but Scottsburg would close out the remaining time on a 10-1 run, ending with a Neace three-ball at the buzzer for a 33-14 halftime margin. The third quarter had Charlestown going on a 9-0 run to cut the Warrior lead to 33-23 with 6:20 to go. But Scottsburg got control of the game with an 18-9 run to end the quarter led by three trifectas by Neace to give the Warriors 51-32 advantage. The final period had Cutter scoring the first eight points on three strong post moves and a smooth baseline jumper as the Warriors extended its lead to 59-37, with 5:20 to play. Cutter scored 10 points in the final stanza to pace Scottsburg. All told Scottsburg turned Charlestown over 16 times while committing 13. The visiting Pirates outscored the Warriors 32-30 in the second half. Also scoring for the Warriors were Sebastiao with seven points; Prince with six and Gibson with three. All told the Warriors used nine players in its rotation on the court. Next up for Scottsburg is a date with MSC powerhouse Brownstown at 7 p.m. on Dec. 7 in Meyer Gym. Charlestown hosts 2A Henryville on Dec. 4. WARRIOR NOTES: The Warrior JV team also won its third straight game, a 44-27 victory at home against Charlestown. . .
Warriorettes Zoe Zellers with the offensive rebound and putback for 2 of her 14 points in the 71-29 victory over Shawe. JV SCORE: Scottsburg 51 - New Albany 36. The Brownstown Braves used a stingy defense and a balanced offense to grab a road win beating the Scottsburg Warriors 57-35 on Friday night in a Mid-Southern Conference affair from historic Meyer Gym. The loss was the first of the season for Scottsburg, now 3-1 overall and in MSC play. Brownstown improved its record to 3-0 overall and 2-0 in the MSC. The Braves were led by senior guard Michael Boshears who had a game high 18 points and senior forward Issac Johnson who had 13. The Warriors were led by freshman forward Hayden Cutter with 9 points and sophomore guard Treyton Owens with 7 points. The game started slowly for both teams as Brownstown ended the first quarter leading 12-9. But the second quarter was all Braves as they limited the Warriors to just two free throws, jumping out to a 28-11 advantage and a lead they would never relinquish. The third quarter had Brownstown going on an early 11-0 run, to take a 39-11 edge before senior guard Jimmy Neace hit a 3-pointer. But the damage had been done and the Braves expanded its lead to 47-20, outscoring the Warriors 19-9 in the quarter. The fourth quarter saw the Warriors get some transition scoring and out pointed the Braves 15-10 to close out the game. "I was disappointed with our play in the first two-and-a-half quarters," said Scottsburg head coach Brent Jameson. "We didn't execute what we had worked on in practice. Brownstown dictated the pace of play and our shot selection was terrible. I was pleased with our effort and getting back to our style of play starting midway thru the third quarter and in the fourth quarter. This is a tough lesson for our kids but we need to continue to work hard and improve." Scottsburg will host 2A Providence on Saturday (Dec. 8), while Brownstown will also host a non-league opponent in 2A South Ripley on Saturday. Warrior Notes: The Scottsburg JV team dropped its first game of the season losing to Brownstown 51-43...The 1968-69 Warrior team that went 20-0 in the regular season making it all the way to Semi-State 50 years ago and posting a 25-1 record was honored between the JV and varsity game. The nickname "Pressure Cooker" was coined by a Louisville sports writer after watching this Warrior team play during the 68-69 campaign led by coach Barley. 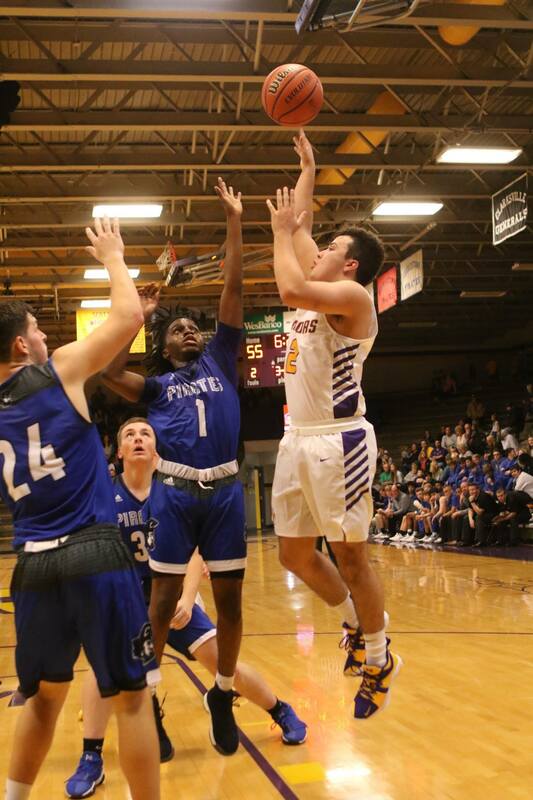 Utilizing a hard nosed defense and a big scoring second half, the Scottsburg Warriors defeated the visiting 2A Providence Pioneers, 67-47 in a non-conference affair in historic Meyer Gym Saturday night (Dec. 8). The victory moved Scottsburg to 4-1 overall, 3-1 in MSC games, while Providence dropped to 2-1 overall. The Warriors were paced in scoring by two seniors, forward Jimmy Neace and guard Mitchell Prince with 19 and 18 points respectively. The two combined to score 30 points points in the second half to blow open a tough defensive game. Junior forward Nick Sebastiao also pitched in 15 points to the Warrior cause. Providence was led by junior forward Austin Grantz with 18 points while junior guard Sterling Huber netted 16 for the Pioneers. "I was extremely proud of our team tonight," said third year head mentor Brent Jameson. "We took a big step in our program coming back after a disappointing loss to Brownstown Central the night before. Providence was rested having a week since its last game. Tonight our defense was solid and in the second half shots starting falling. Both Mitchell and Jimmy really played off each other leading us to a big second half. I was pleased with the defensive effort of our entire team, especially sophomore guard Ryan Gibson who gave us some key minutes of playing time. He took some charges and had four rebounds." The game started slowly with Providence holding a 13-9 lead after the first quarter. Both teams were stone cold from the field while defense dominated. The second quarter had Scottsburg outscoring their guests 11-8 but the Pioneers would head into the locker room with a fragile 21-20 lead. The third quarter was all Scottsburg as both Neace and Prince went to work, scoring 19 of the Warriors 25 points in the period. Prince had 7 including a three ball, while Neace had 12, all via 4 trifectas, with his last dagger at the buzzer to give Scottsburg a commanding 45-33 advantage after three quarters. All told the Warriors outscored the Pioneers 25-12 in the game changing stanza. The final period opened with Prince and sophomore guard Treyton Owens combining for 7 points putting the Warriors up 19 at 52-33 with 6:06 to play. Prince and Sebastiao continued their solid work on the offensive end scoring 9 and 7 points in the quarter respectively, as the Warrior lead swelled to 20. Scottsburg outscored Providence 22-14 in the final quarter. Statistically speaking, the Warriors were 21-of-52 from the floor for 40%; 8-of-23 behind the 3-point line for 33% and 17-of-24 from the charity stripe for 71%. Scottsburg out rebounded the Pioneers 37-32 while forcing 19 turnovers and committing 15. The Warriors limited Providence to 38% from the field and 22% from the 3-point line. Rounding out the scoring for Scottsburg, Owens had 7; freshman forward Hayden Cutter 6 and Gibson 2 points. Prince was 8-of-10 from the free throw line and led the team with 4 assists. Neace had a game high 3 steals and also added 3 assists. Sebastiao had a team high 8 rebounds while Owens grabbed 7 boards. The Warriors next game is Friday, Dec. 14 at Corydon Central in an important MSC affair. Warrior Notes: The Scottsburg JV team beat Providence 54-40 and is now 4-1 for coach Dustin Marshall. . .The victory by the varsity moved the Warriors record to 40-28 all time against Providence and 15-12 in the last 30 seasons. . . The win avenged a 62-40 loss almost a year to the day to Providence. 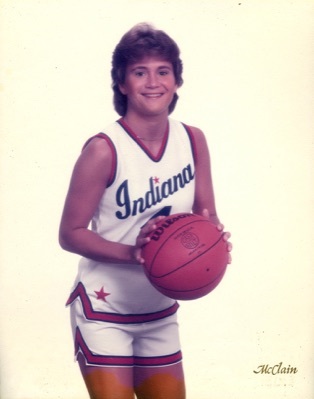 . .
Congratulations Sheryl Bonsett on your inclusion in the Indiana Basketball Hall of Fame 2019 Women’s Induction Class to be honored on Saturday, April 27, 2019. Bonsett was a 1985 Indiana All-Star after totaling 1,011 points and 361 assists at Scottsburg under Hall of Fame coach Donna Cheatham. 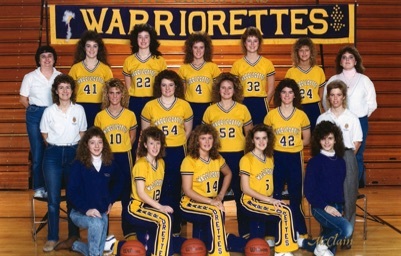 A four-year letterwinner on Warriorettes teams that were 71-12, she was a two-time team MVP, led the team in assists for three seasons and in steals two seasons. She averaged 17.3 points and 5.2 rebounds senior season and was a member of the Warriorettes’ 1983 regional championship team. In four years at Eastern Illinois University, she started 96 of 116 career games played, graduating 8th in program history with 1,012 points, 2nd in career assists with 435 and 5th in program history with 166 steals. JV SCORE: Scottsburg 41 - Mitchell 38. 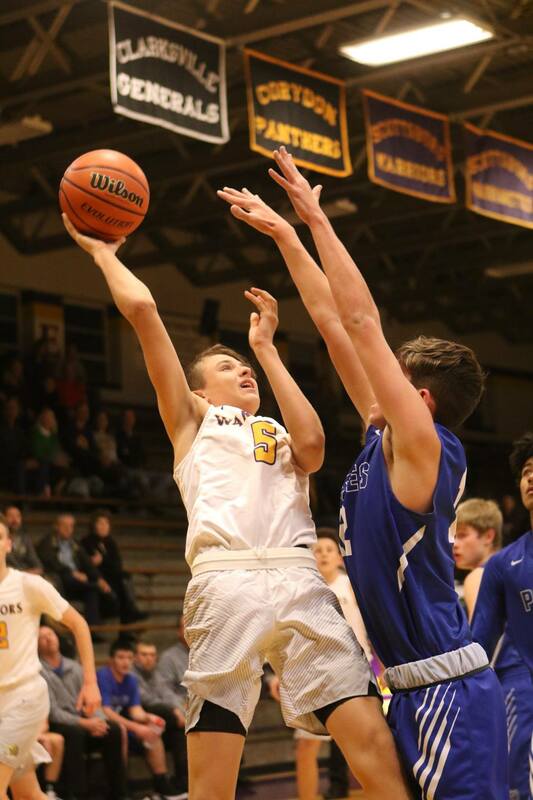 The Scottsburg Warriors let a 17 point halftime lead slip away as the Corydon Central Panthers used a huge second half scoring binge to register a hard fought 83-79 overtime home win in a Mid-Southern Conference shoot out Friday night (Dec. 14). The Panthers were led by a pair of 30 point performances as seniors Joey Wiseman and Bradley Nalley combined for 69 points, netting 35 and 34 respectively. The Warriors were paced by freshman forward Hayden Cutter with 24 and junior forward Nick Sebastiao with 16. Sophomore guard Treyton Owens had 12, while senior guards Mitchell Prince and Jimmy Neace had 11 points each. Junior forward Brantley Deaton had 5 points in his first action of the season for Scottsburg. The win moved Corydon Central to 3-3 overall and 2-0 in MSC play. The loss dropped Scottsburg to 4-2 overall and 3-2 in MSC action. "Obviously a disappointing tough loss to let a team back in the game when we had such a large lead," said Warrior head coach Brent Jameson. "Too many turnovers and missed opportunities throughout the game, especially defensively. We let their two best players score 69 points and we then became hesitant on offense. After games we take the approach: 'what could we have done better' as individuals and a team. I need to have our group better prepared for the situations we faced tonight. We will regroup and get ready for the Scott County Tournament next week." 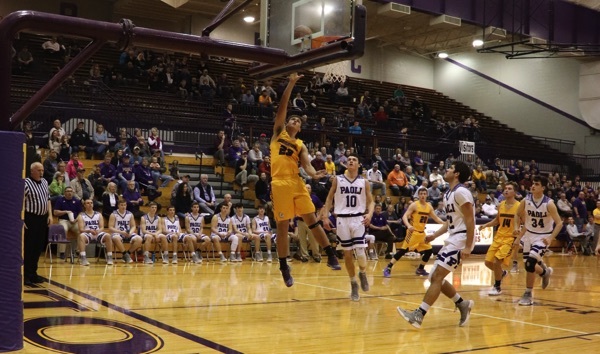 The game was a tale of two halves as Scottsburg jumped out to a commanding 38-21 lead at the intermission with solid defense and a superior rebounding effort. Wiseman had just 5 points while Nalley had 13 to total 18 of the Panthers 21. But the second half would tell a different story. Scottsburg would still maintain a 13 point lead after three quarters as the Corydon Central offense began heating up. The Panthers opened the final quarter on an 10-2 run to close within 59-54 at the 5:15 mark. After Neace scored on a put back to put Scottsburg up 66-60, he fouled out moments later, midway thru the quarter. The Panthers closed the gap to 67-66 with just under two minutes to play, before the Warriors went ahead by 5 points, 72-67, behind Deaton's 3-ball and a driving layup by Sebastiao assisted by Owens. It would be the final points of regulation for Scottsburg as Wiseman and Nalley rallied Corydon to a 72-72 tie as time expired. Overtime began with Corydon taking its first lead of the game since midway thru the first quarter, at 74-72. Sebastiao would then foul out early in the overtime. Scottsburg grabbed the lead back with 1:20 remaining at 79-77, but would then lose Cutter with 5 fouls. The Panthers scored the final six points of the game. Wise and Nalley netted 9 of the 11 points scored by Corydon in the extra period. Scottsburg had opportunities to come back in the waning moments, but committed untimely turnovers. Wise, held to 5 points in the first half, exploded for 30 in the second half. Nalley had 21 second half points as the pair netted 51 of the Panthers 62 after intermission. Statistically speaking, Scottsburg had 21 turnovers while the Panthers committed 13. 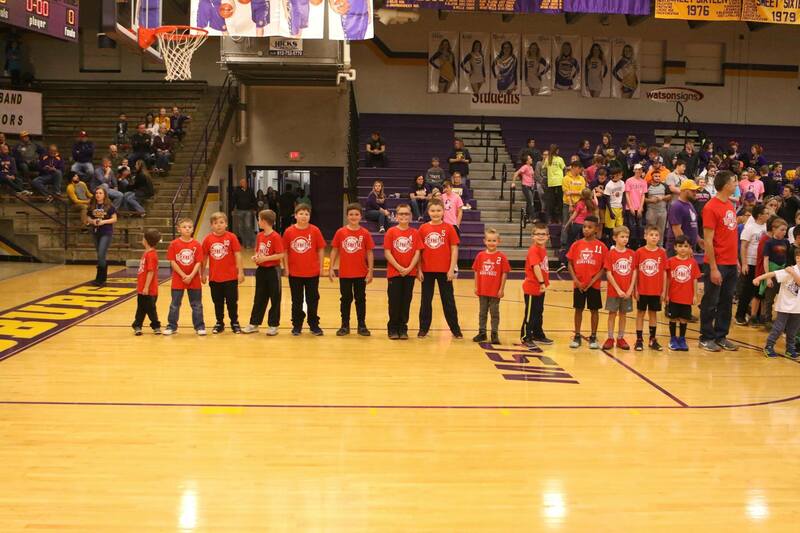 The Warriors shot just 50% from the free throw line making 14-of-28, while Corydon hit 27-of-44 charity tosses. Scottsburg had 9 three-pointers with Neace and Prince getting 3 each. 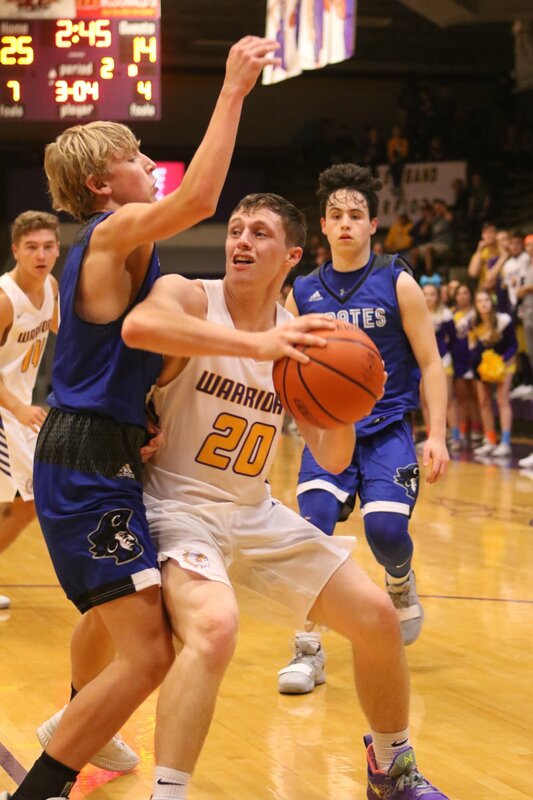 WARRIOR NOTES: The Scottsburg JV squad is now 5-1 under coach Dustin Marshall as the Warriors defeated Corydon, 50-49 in overtime. Noah Smith hit the game tying field goal in regulation, while Jordan Myers had the game winning 3-pointer with 2.5 seconds to play in the OT. . .Senior guard Mitchell Prince had a tough night for the Warriors as he played thru Friday's game with a stomach flu bug. He was still able to score 11 points. . .
Next game for Scottsburg is Thursday (Dec. 20) at home in Meyer Gym against South Central (Elizabeth) at 7:30 p.m. in the opening round of the Scott County Invitational. The Warriors will also play on Friday and Saturday against opponents and at times TBD in the historic "Pressure Cooker" during the three day event. Congratulations PATTY (HUTCHINSON) CLANCY on being selected to the 2019 Indiana Basketball Hall of Fame Silver Anniversary Team! Three-year all-state honors included 1993 ICGSA 2nd team all-state and AP honorable mention all-state… graduated as 2nd leading scorer in Scottsburg history with 1,533 points, along with 527 rebounds, 204 assists and 194 steals… two-time team MVP averaged 22.0 points and 7.0 rebounds as senior and 22.1 points and 9.1 rebounds as a junior as part of teams that were 63-23, winning three sectional titles, 1994 regional championship and three conference titles… scored 1,029 career points at Ball State University, averaging 13.4 points as a senior… an elementary teacher for 19 years, she has been varsity head coach at Madison H.S., varsity assistant at Southwestern (Hanover) and Homestead and a 7th grade coach… currently a fifth grade teacher in Scottsburg… married with two children, she resides in Scottsburg. The Scottsburg Warriors used a balanced scoring attack with three players in double figures, defeating the South Central (Elizabeth) Rebels, 61-45, in the opening round of the Scott County Invitational Thursday (Dec. 20) in historic Meyer Gym. The non-conference win moved Scottsburg to 5-2 on the season heading into Friday's game with Crothersville. South Central fell to 2-5 and plays next on Saturday versus Crothersville. The Warriors were paced by senior guard Jimmy Neace with 16 points, followed by freshman forward Hayden Cutter with 13 and senior guard Michell Prince with 12 on four 3-point field goals. The Rebels were led by Lucas Stewart who had a game high 28 points, including 6 trifectas. "Overall we played really well," said Warrior head mentor Brent Jameson. "South Central had lost close games coming in and are a solid defensive team. Our practice coming into the game carried over as we focused on turnover to assist ratio. The fast break was really solid. A good team effort. I appreciated the way Jimmy (Neace) played on both ends. Really efficient. Brantley Deaton had an excellent floor game and was our anchor at times defensively. South Central made a great run late and we had some excellent leadership from Mitchell Prince to lead us to key stops." After a tight first quarter Scottsburg led 14-12 and expanded the lead to 29-18 at the half allowing the Rebels just 6 points in the 2nd quarter. The Warriors expanded the lead to 14 points after three quarters, 50-36. But midway thru the final stanza South Central got to within 9 points at 54-45. It would be as close as the Rebels would get as the Warriors ended the game with a 7-0 run, clamping down on defense as Neace scoried 5 of the points on a 3-ball and a couple of free throws. Scottsburg limited South Central to 9 points in the quarter. 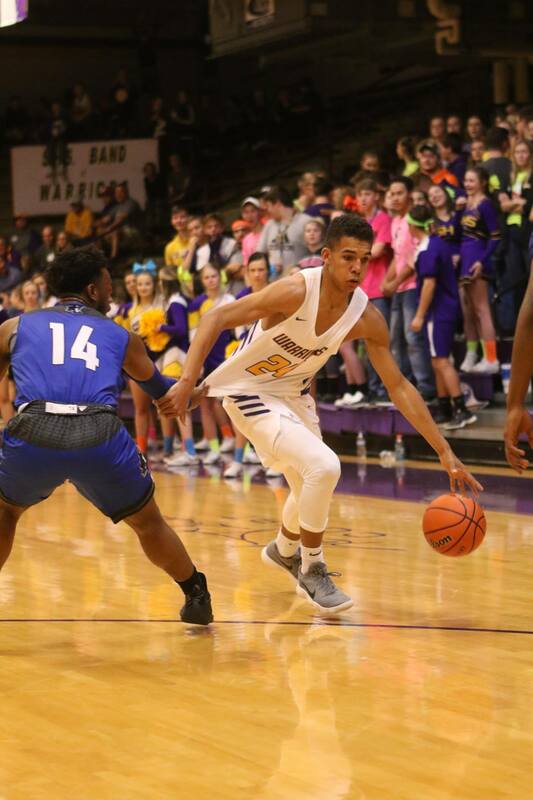 Statistically speaking the Warriors had 20 assists while committing 12 turnovers (4 in the second half) and forced 16 Rebel miscues...Scottsburg limited the Rebels to 4 points in the paint in the 1st half, 15 total, while scoring 33 inside...The Warriors had 27 points in transition while giving up 5...Scottsburg had 14 offensive rebounds to 4 while piling up a 30-16 rebound edge for the game. Rounding out the scoring for Scottsburg Nick Sebastiao had 9 points while Treyton Owens and Brantley Deaton contributed 6 and 5 respectively. 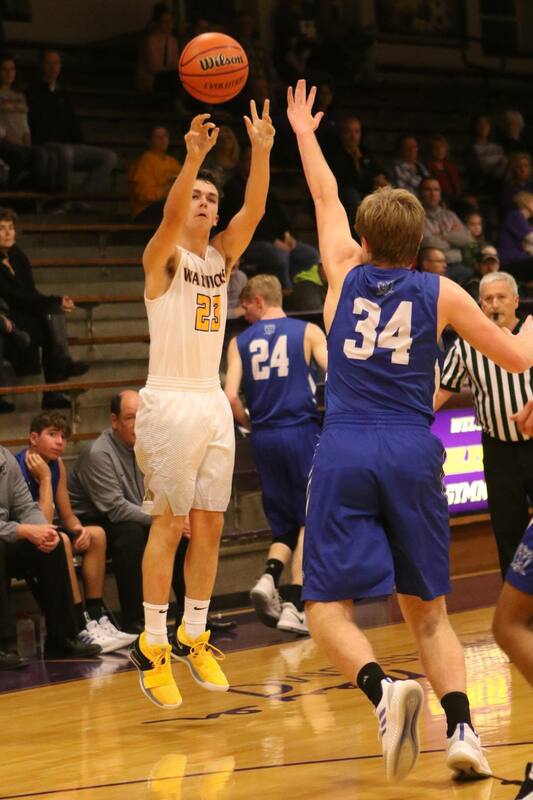 Hayden Cutter and Treyton Owens combined for 26 second half points as the Scottsburg Warriors registered a 57-40 victory over the Crothersville Tigers Friday night in the Scott County Invitational at historic Meyer Gym. The victory moved Scottsburg to 6-2 on the season while Crothersville dropped to 5-2. The Warriors have advanced to the championship game at 8 p.m. on Saturday (Dec. 22) against an opponent TBD in Meyer Gym. "Not a great start, but give Crothersville credit as they hit some 3's and were solid defensively," said Warrior head coach Brent Jameson. "This game was a good step for us. We took their best shot early and bounced back. I felt we were more aggressive on defense, especially in the second half, where we extended some things. Treyton (Owens) had an outstanding floor game tonight and did everything well. Hayden (Cutter) continues to play like he isn't a freshman. I was pleased with the way everyone played defensively." Cutter, a freshman forward, had a game high 18 points, 16 in the second half mostly on strong inside looks. Owens, a sophomore guard, had 14 points, 10 in the second half, as the Warriors came back from a one point halftime deficit to outscore the Tigers 37-19 in the final two periods. Both teams had scoring opportunities in the first half, but the defenses ruled as Crothersville hit five 3-balls to lead 13-10 after the first quarter and 21-20 at the intermission. Scottsburg came out quickly in the third quarter as Owens and Cutter started their scoring binge, giving the Warriors a 24-21 lead at the 6:55 mark of the third quarter. Scottsburg would never again trail in the game and outscored Crothersville 19-10 in the quarter. Cutter had 10 points leading the Warriors to a 39-31 advantage heading into the final stanza. In the final quarter Scottsburg's defense went to work allowing the Tigers just one point over a 5-minute span, taking a 43-32 lead. Owens led the Warriors with 8-points in the quarter as Scottsburg would out point Crothersville 18-9 in the period. 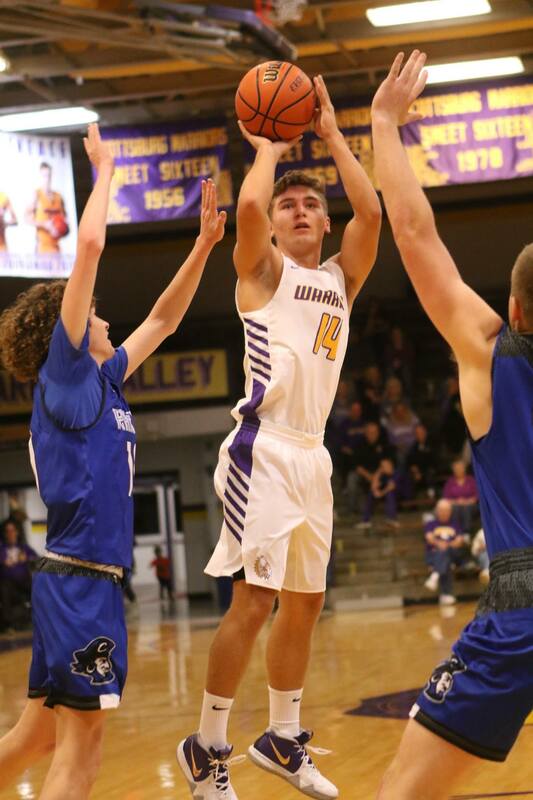 Rounding out the scoring for Scottsburg was senior guard Jimmy Neace who had 10 points including two 3's; junior forward Nick Sebastiao 6-points; senior guard Mitchell Prince had 5; and junior forward Brantley Deaton tallied 4-points. The defense for Scottsburg was solid all game long with every player on the roster contributing to the win. Leading the Tigers was senior Logan Brewer with 11 points, along with junior Josh Thomas with 10. Crothersville had eight 3-pointers and scored six 2-pointers in the game. 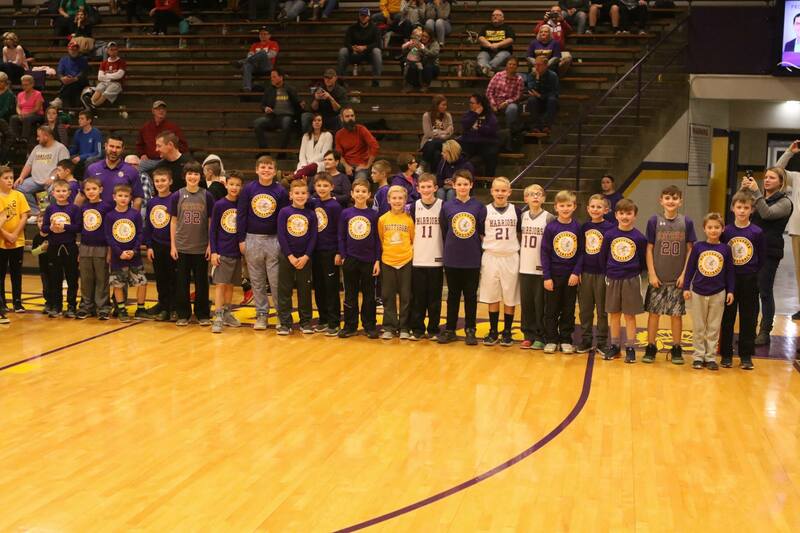 WARRIOR NOTES: The Scottsburg junior varsity defeated Crothersville, 60-35 in the preliminary game Friday evening. The JV Warriors are now 6-1 for coach Dustin Marshall. One thing was certain heading into the championship game of the Scott County Invitational on Saturday (Dec. 22). The "Warriors" would be victorious. That was a fairly reasonable outcome since both teams use that moniker as their respective nickname. A headline could read: "Warriors Defeat Warriors!!!" 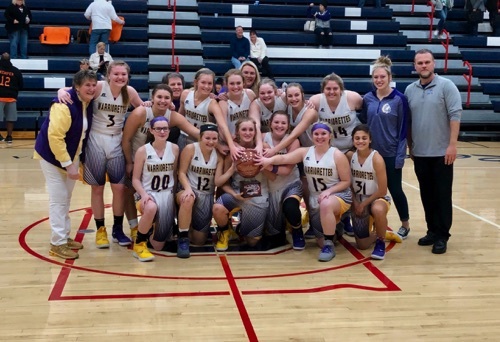 As it turned out the Scottsburg Warriors defeated the Christian Academy Warriors, 49-39, in a defensive battle at historic Meyer Gym for the championship. 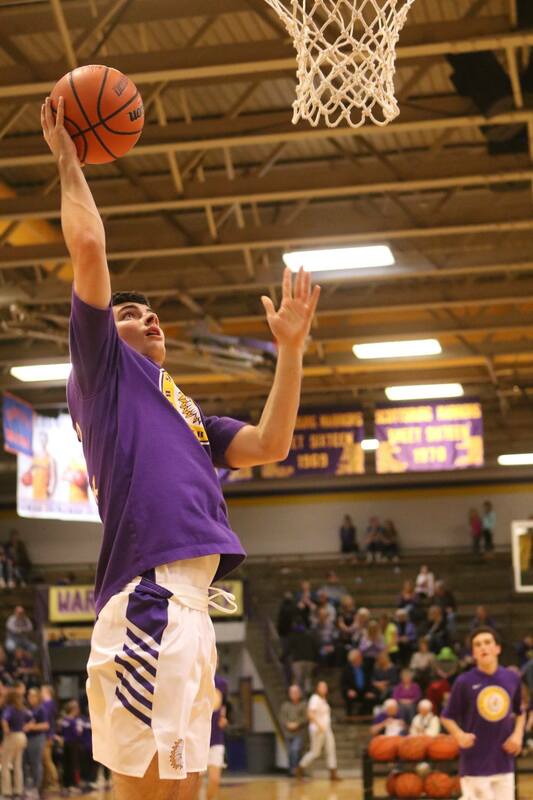 Scottsburg had three double figure scorers in Nick Sebastiao, 15 points; Hayden Cutter, 11; and Treyton Owens 10. Christian Academy was led by Josh Hahn with 12 points and T.J. Procter who chipped in 8. The win moved Scottsburg to 7-2 overall while the loss dropped Christian Academy to 5-3. "We defeated a good team, that is well coached and disciplined, " said Scottsburg head mentor Brent Jameson. "It was an ugly game at times, but I am proud of our guys and how we executed on the defensive end. Nick Sebastiao picked us up in the second half with his scoring. Mitchell Prince played thru an injury and made numerous plays for us that don't show up in the stat sheet. Our team is balanced and sharing the ball. This is a fun group to coach." The game was tied early in the opening period at 3-3, but Scottsburg expanded that to 14-5 with 1:41 to go. Scottsburg rode the scoring of Sebastiao and Owens who scored 4 points each, along with 3-balls by both Jimmy Neace and Prince early on along with an inside bucket by Hayden Cutter. All told Scottsburg led 16-9. The second quarter had Scottsburg outscoring Christian Academy 11-8, with Cutter and Owens scoring all the points with 7 and 4 respectively. Scottsburg would take a 27-17 lead into the intermission. In the third quarter after a Brantley Deaton 3 pointer and a pair of Cutter free throws, Scottsburg would grab its biggest lead of the game, 34-21 with 1:55 to go. Christian Academy would score five straight points, before Owens finished the scoring of the quarter with a deuce to get Scottsburg back to a 10 point lead at 36-26. Each team scored 9 points in the rugged defensive battle. The fourth quarter had Christian Academy scoring six straight points to cut the Scottsburg lead to four at 36-32 with 6:12 to play. Sebastiao would answer with seven straight points increasing the Scottsburg advantage to 43-32 with 3:46 remaining. Christian Academy would cut the lead to seven points at 43-35 with 2:46 to play but would get no closer. For the second straight quarter each Warrior squad would score the same number of points as their opponent, 13. Rounding out the scoring for Scottsburg, senior guards Neace and running mate Prince had 5-points while Deaton scored 3. Scottsburg was 14-16 from the free throw line, making 7-9 in the crucial final quarter to preserve the victory. Next up for Scottsburg is a Jan. 4 non-conference affair with 3A Madison on the road. Christian Academy plays 3A Southridge on Dec. 27. WARRIOR NOTES: The seven (7) victories for Scottsburg this campaign equals the Warriors win total from last seasons 7-18 record. There are 14 regular season games to play in the 2018-19 schedule. . .
NEXT GAME: Scottsburg v. Lawrenceburg, 6:45 pm, Dec. 29, 2017. 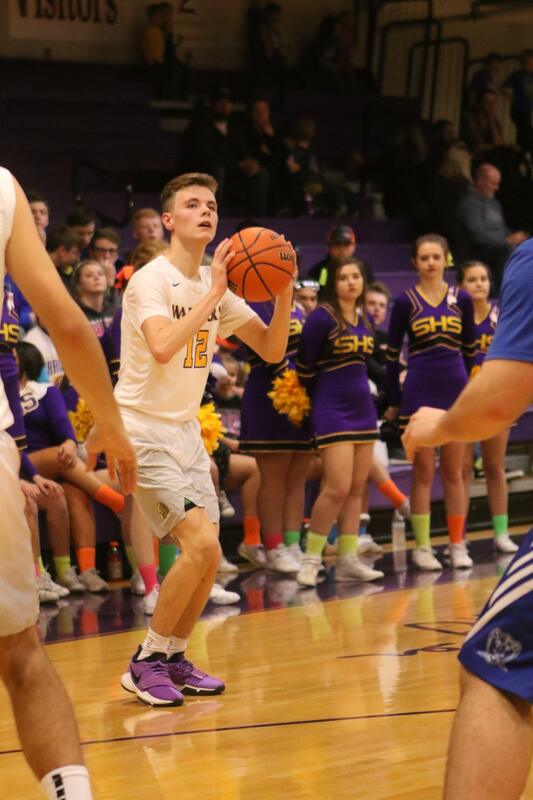 Senior guard Jimmy Neace forced a steal with under 10 seconds remaining and freshman forward Hayden Cutter knocked down two free throws with 5.7 seconds to play as the Scottsburg Warriors grabbed a road win over the 3A Madison Cubs, 55-54 on Friday (Jan. 4). The non-conference victory over their rivals from the Hoosier Hills Conference moved Scottsburg to 8-2 overall. The loss dropped Madison to 7-3 this season. The Warriors benefited from a 25-point performance by junior swingman Nick Sebastiao who led all scorers with 25 points and 9 rebounds. Sebastiao was 7-12 on 2-pointers and 3-6 on three balls. He was joined in late game heroics by Cutter who posted 15 points and 7 boards (4 on the offensive glass), and was 6-9 from the floor and 3-4 from the charity stripe. Madison grabbed a 51-48 lead with 2:20 to play after a three point play. Sebastiao missed the front end of a 1-and-1 at the 2:04 mark, but Scottsburg regained the lead at 52-51 after four straight inside points by Sebastiao with 21 seconds remaining. As Madison was working its offense for a winning look, Neace came up with a steal and was fouled driving to the basket with 6.9 seconds to go. Neace made the first charity toss, but missed the second giving the Warriors a 53-51 advantage. However, his miss went long and Cutter battled from the low bloc gaining control of the rebound and was immediately fouled by the Cubs with 5.7 seconds to play. Cutter buried both free throws giving the Warriors a 55-51 lead. Madison made a long 3-ball at the buzzer for its final 54 points. The game was close throughout as Madison led 16-13 after the first quarter and 32-30 at intermission. Scottsburg outscored the Cubs 12-9 in the defensive battle to grab a one point lead of 42-41 after three quarters. The teams played to a 13-13 draw in the 4th quarter. All told Madison held its biggest lead of 6 points at 19-13 in the 2nd quarter. The Warriors biggest lead in the game was four points at 55-51 late in the final quarter. All told the game was tied seven times and had 11 lead changes. Other scorers for Scottsburg included sophomore guard Treyton Owens with 8-points, 3-assists, 2-steals and 3-rebounds; Neace had 4-points and 3-rebounds; Brantley Deaton, a junior forward, had 2-points and 4-rebounds; senior guard Mitchell Prince had 1-point, 2-assists and 2-rebounds with just 1 turnover as a primary ball handler. Senior guard Patrick Lincoln didn't score but provided the Warriors with some key minutes. Yancey Cooper led Madison with 21 points while teammate Nick Center had 10. Mason Welsh and Lake Miller scored 9-points respectively. The Cubs were 8-16 (50.0%) from behind the 3-point line in the first half but finished the game at 10-26 (38.5%) going 2-10 (20.0%) in the second half. Madison was turned over 12 times by Scottsburg while the Warriors committed just 6 turnovers to win the points off turnovers battle at 17-10. The game was won at the free throw line as Scottsburg's inside play got them to the line 19 times while making 11 (.57.9%). Madison was 4-4 (100.0%). The rebounding was even a 33 for both teams. Scottsburg shot 41.7% from the field while Madison was at 38.5%. The Scottsburg junior varsity lost to Madison, 50-46. The JV Warriors are now 6-2 for coach Dustin Marshall. 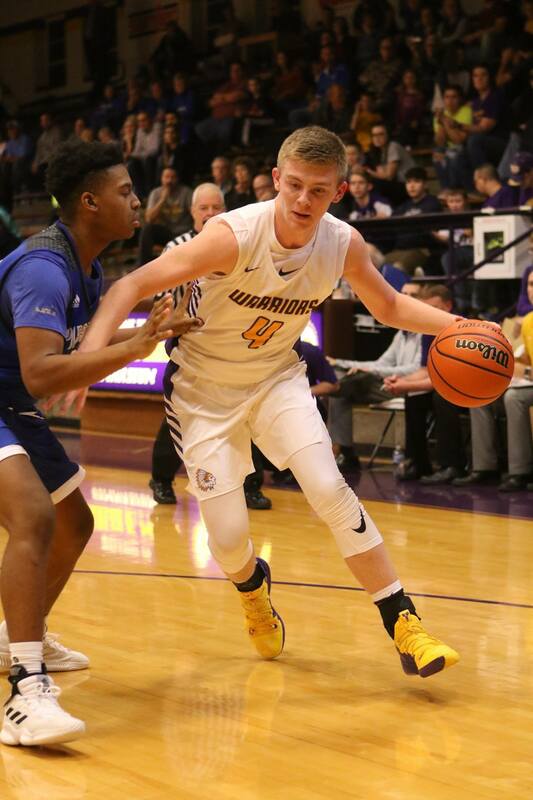 Led by senior guard Mitchell Prince's game high 22 points, the Scottsburg Warriors posted a 58-52 home victory over the North Harrison Cougars in a Mid-Southern Conference matchup at historic Meyer Gym on Saturday (Jan. 5). The win was the fifth straight for Scottsburg putting the Warriors at 9-2 overall and 4-2 in MSC play. North Harrison dropped to 4-6 overall and 0-5 in MSC games. Prince was deadly from behind the three-point line (5-10 for the game) connecting on three trifectas early in the opening quarter, tallying 9 first half points. He collected two more treys in the second half and added 7-of-10 free throws. Prince's five free throw makes in the final quarter helped the Warriors maintain its slim lead. He also added 4 assists and 2 steals for the night. Prince was joined by freshman forward Hayden Cutter with 13 points, 6 rebounds and 2 blocked shots ; senior guard Jimmy Neace with 10-points; sophomore guard Treyton Owens with 8 points on two-3 balls along with 4 rebounds, 4 assists and 2 steals; and junior forward Nick Sebastiao with 5-points. 4-rebounds and 4-steals. North Harrison was paced by L.T. Hatton with 21 points, 8-rebounds and 3-blocks along with Braden Jenkins and Skyler Wenzel who added 10 points each. "A good win for us because of the size and matchup problems North Harrison gave us," said Warriors third year head coach Brent Jameson. "It was a frustrating game at times because we missed several opportunities to extend the lead, but didn't because of some mental mistakes. Small things, but wins never come easy and we will review those errors and continue to improve. Mitchell (Prince) had the hot hand and our guys were able to find him. He was effective on the defensive end as well. Treyton (Owens) had another efficient game hitting a couple of 3's at key times and making plays. He played with a lot of confidence ." The Warriors opened the game hot and led 11-4 after Prince's third 3-pointer but the Cougars would rally to outscore Scottsburg 11-6 to cut the lead to 17-15 after a quarter. 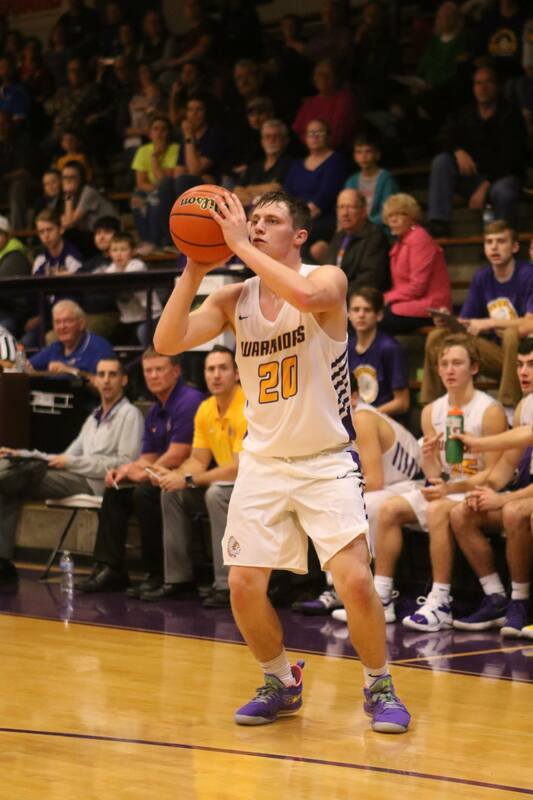 The second quarter saw Scottsburg slowly increase its margin and lead by 9 points as the Warriors held the Cougars scoreless the final 2:38 of the stanza, taking a 29-20 advantage into halftime. Prince and Cutter combined for 17 of the Warriors 29 first half points. The third quarter had the Warriors widen its lead to 34-22 at the 6:06 mark when Prince connected on a couple of free throws. But from that point on North Harrison would go on a 12-6 run, ending the quarter down by six points at 40-34. The final quarter had North Harrison getting within 2 points with 4:00 to play at 45-43. But Prince would make two free throws and Cutter would add a basket to get the lead back up to 6 points with 3:19 to go. The Cougars weren't done and hit a three with 2:50 remaining, cutting the Warriors lead back to three. But just 15 seconds later Owens would drain a long corner trifecta to put the Warriors back up by six. The Cougars would not get closer then five points the rest of the contest. Prince had 13 points in the second half. Statistically speaking. . .Scottsburg was 19-44 (43.0%) from the field; 8-20 (40.0%) on 3-balls and 12-21 (57.0%) from the free throw line. The Warriors had 24 rebounds; 13 assists; 13 steals; 3 blocked shots and 15 turnovers. Scottsburg had 17 fast break points; 11 points off turnovers and 2 second chance points. . .North Harrison was 22-49 (45.0%) from the field; 2-10 (20.0%) on 3-pointers; 6-13 (46%) from the charity stripe; had 33 rebounds (14 offensive); 16 assists; 7 steals; 4 blocks and 22 turnovers. The Cougars had 6 fast break points; 15 second second chance points; and 9 points off Warrior turnovers. The Warrior junior varsity defeated North Harrison 56-54 in double overtime to improve its record to 7-2 for coach Dustin Marshall. Next up for Scottsburg is a Friday, Jan. 11 home meeting with MSC foe Salem in Meyer Gym at 7:30 p.m. The Warriors will then host a non-league affair in Meyer Gym with 4A powerhouse New Albany on Saturday, Jan. 12 at 7:30 p.m. 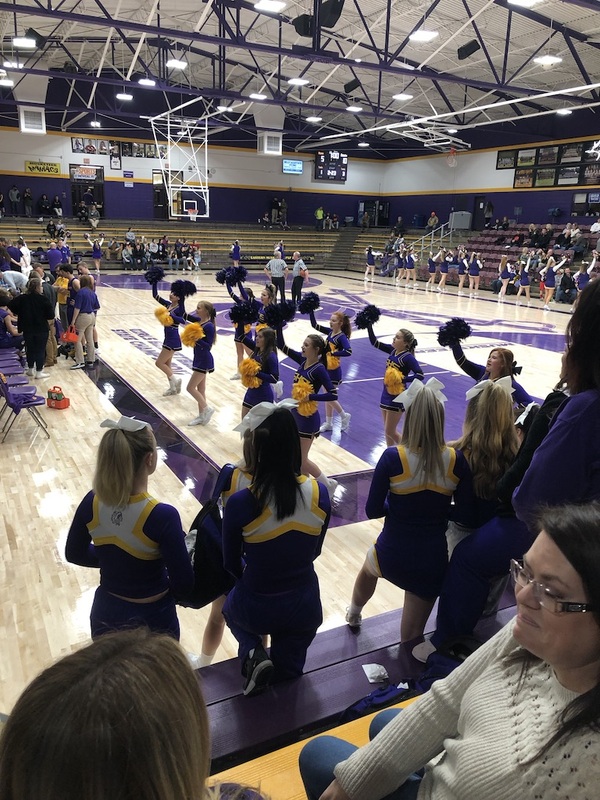 Playing its best defense of the season, the Scottsburg Warriors allowed the visiting Salem Lions just 14 first half points cruising to a 73-49 home Mid-Southern Conference win Friday (Jan. 11) in historic Meyer Gym. The victory, the Warriors 6th straight. moved Scottsburg to 10-2 overall and 5-2 in MSC play. The Lions fell to 8-5 overall and 0-2 in MSC play. The Warriors had four players in double figures led by freshman forward Hayden Cutter who led all scorers with 25 points on 11-13 field goals on strong inside moves and jumpers in the key. He also contributed 5-rebounds, 3-blocks and 1-steal. Joining him were senior Jimmy Neace with 17 points including 5-three balls; along with sophomore guard Treyton Owens and junior forward Nick Sebastiao with 10 points each. But the outcome was dictated on how the Warriors performed on the defensive end as they outscored Salem 28-13 in points off turnovers. Scottsburg forced 17 Salem turnovers with 13 steals; out rebounded the Lions 40-30 (16-10 on the offensive glass); and had a 28-13 edge in second chance points. Another key stat was 22 assists for the Warriors on 29 made baskets. "This was our best defensive effort of the season," third year Warrior mentor Brent Jameson said. "We got back to our basic foundation of what this program is based on, defense. We worked all week on it in practice. Tonight we were able to produce many transition opportunities and I was proud how we shared the ball. Having 22 assists on 29 makes proves that. Hayden (Cutter) is the best freshmen in southern Indiana. Jimmy (Neace) was finding his shot and produced some momentum changers with his threes. Treyton (Owens) had a tough shooting night but rebounded well and had no turnovers. Nick (Sebastiao) was an outstanding defensive presence, disrupting their offense and fueling our transition game. Mitchell (Prince) continues to excel with his primary ball handling (zero turnovers) and defensive savvy." Scottsburg led 16-6 after the first quarter and 38-14 at the half as Neace hit a buzzer beating 3-ball dagger for a 24 point margin. The Warriors led 56-34 after three quarters and in the final stanza led by as much as 31-points with 2:37 to play, 73-42. The teams played to a 35-35 tie over the last two periods. The Lions were led by a pair of 16 point performances as guard Myron Mead and sophomore guard Brody Pepmeier paced the Salem attack. Sebastiao led the Warriors in rebounding with 9, and also had 4 steals, 3 assists and 2 blocks. Owens had 8 rebounds, led the team with 5 assists and had a steal. Prince totaled 5 points, 3 assists, 1 block and 1 steal. Junior forward Brantley Deaton had 2-points, 5 rebounds, 2 assists and 2 steals. Earning a start, senior guard Patrick Lincoln had a solid outing with 2 points, 3 rebounds, 3 assists and 1 steal. Sophomore guard Noah Smith had 2 points, 1 rebound and 1 assist. Sophomore Alex Witt didn't score but had 2 rebounds. 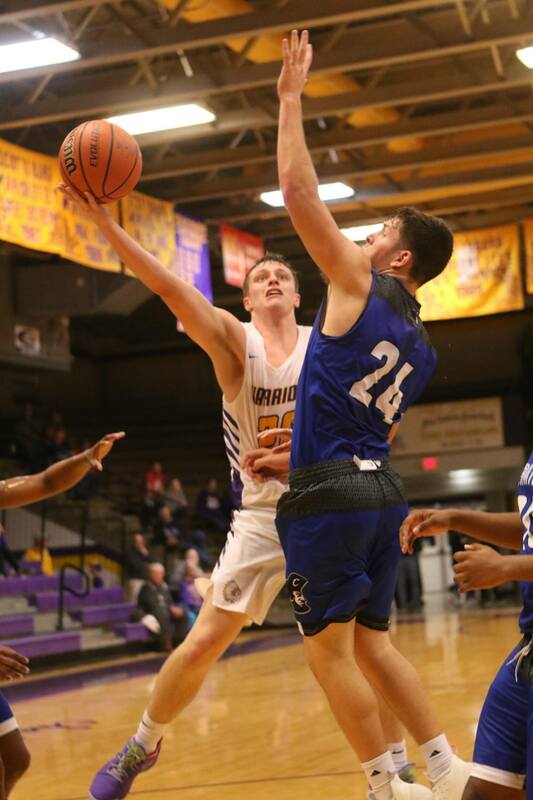 Statistically speaking. . .Scottsburg was 29-63, 46.0% from the field; 8-25, 32.0% on 3's; 7-11 63.6% from the line; had 40 rebounds; 22 assists; 13 turnovers; 5 blocks; and 13 steals. Salem was 18-51, 35.3% from the field; 2-11, 18.2% on 3's; 11-15, 73.3% from the line; had 30 rebounds; 5 assists; 17 turnovers; 1 block; and 4 steals. Next up for Scottsburg is a Saturday (Jan.12) non-conference game with 4A power New Albany at Meyer Gym. 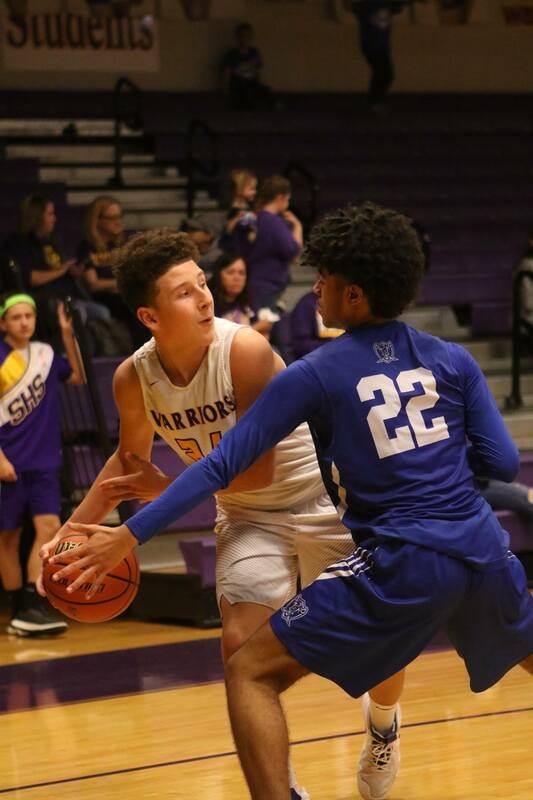 Warrior Notes: The Scottsburg junior varsity posted a 53-22 win over Salem to move its record to 8-2 overall under the direction of coach Dustin Marshall. Hopefully the Scottsburg Warriors learned some valuable lessons in its 54-38 home non-conference loss Saturday (Jan. 12) to the 4A New Albany Bulldogs of the Hoosier Hills Conference. It certainly was a tough defeat in front of the home crowd at historic Meyer Gym as the Warriors saw its six game winning streak abruptly stopped. Scottsburg dropped to 10-3 overall, while New Albany improved to 7-5. The lessons delivered from a more experienced team should only help the Warriors in its remaining regular season schedule. 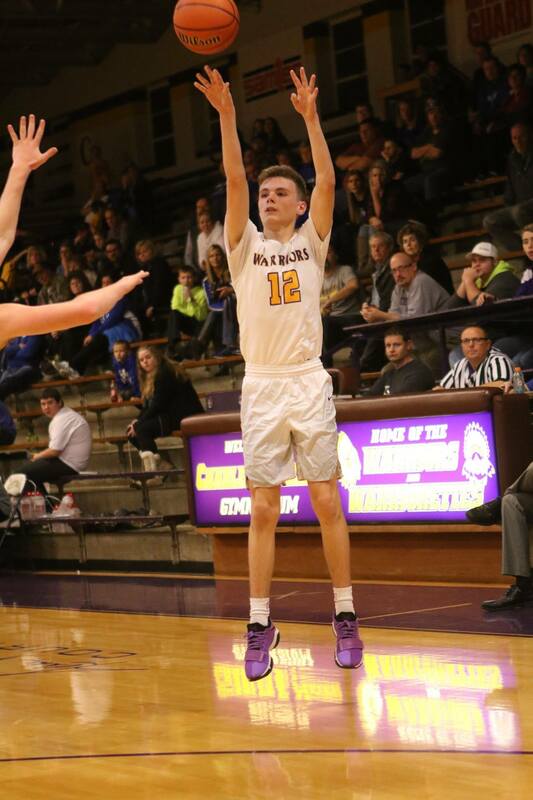 Freshman forward Hayden Cutter led Scottsburg in scoring and rebounding with 18 points and 11 boards, connecting on 8-15 from the floor with an impressive "double-double." He was joined by junior swingman Nick Sebastiao with 10 points, 6 rebounds, 3 steals, 2 blocked shots and 2 assists Senior guard Mitchell Prince had 6 points on two three-pointers while sophomore guard Treyton Owens scored 4 points. Only four Warriors scored in the game. The Bulldogs were led by Derrick Stevenson with 16 points and Landen Sprigler with 8, while six other players contributed points in the New Albany balanced attack. "I was pleased with the approach and effort our team had in this game," said Warrior head coach Brent Jameson. "We didn't execute well enough at times, but a team such as New Albany dictates much of that. They were quick and physical as expected. I feel we competed well and were just a few plays away from narrowing the gap even more. Our team will regroup and continue to improve." Scottsburg grabbed a 4-0 lead to open the game before New Albany went on an 8-0 spurt. The quarter ended with the teams tied, 8-8. The second stanza was all New Albany as the Bulldogs outscored the Warriors 24-8 in the period with defensive pressure and transition points. New Albany took a 32-16 lead into halftime. The third quarter had the Bulldogs increasing their margin to 22 points before Scottsburg made a run, cutting the margin to 12 at 44-32. The Warriors outscored New Albany 16-12 in the period as Cutter had 8 points. The final stanza had both teams digging in defensively, but Scottsburg went cold as New Albany scored the first 8 points of the quarter to extend its lead to 20 points early on. The Bulldogs would not score again, but the Warriors would get no closer than the final 16 point margin. Both teams tallied 22 points in the second half. New Albany forced 13 Scottsburg turnovers resulting in 21 points. The Bulldogs had 17 points in its transition game. Those same statistical areas, usually a positive for the Warriors, told the story in the defeat. Scottsburg had 6 points off 9 New Albany turnovers and just 7 points from its transition game. Combine that with 16-45 field goal shooting (36.0%) along with 2-14 (14.0%) on three pointers and you have a recipe for a loss. Statically speaking. . .Scottsburg was 4-8 (50.0%) on free throws; 28 rebounds (11 on offense); 8 assists; 5 steals; 2 blocks; 13 turnovers and 9 fouls. New Albany was 22-49 (45.0%) from the field; 5-21 (24.0%) on three's; 5-7 on free throws (71.0%); 30 rebounds (9 on offense); 10 assists; 7 steals; 4 blocks; 9 turnovers and 12 fouls. The Warrior junior varsity lost to New Albany, 57-34. Coach Dustin Marshall's team is now 8-3 overall. 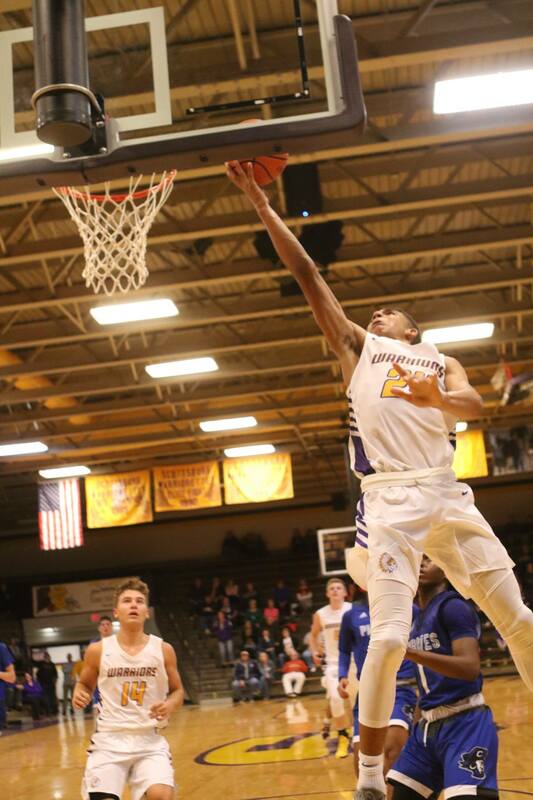 Next up for Scottsburg is a Friday (Jan.18) Mid-Southern Conference affair at Clarksville followed by a non-conference match up at home Saturday (Jan. 19) against 4A Seymour. 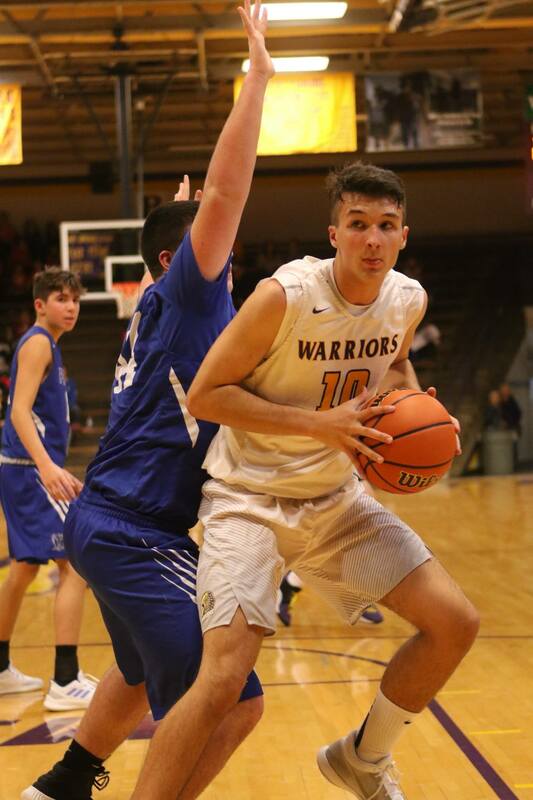 Led by freshman forward Hayden Cutter's 17 points, the Scottsburg Warriors had four players score in double figures, made 7-of-8 free throws in the final minute of play and held off the host Clarksville Generals, 68-60, Friday (Jan. 19) in a Mid-Southern Conference game. Scottsburg earned the win despite a game high 31 points from sophomore guard Dae'von Fuqua for the Generals. The victory moved Scottsburg to 11-3 overall and 6-2 in the MSC. Clarksville dropped to 3-10 and 1-4 in MSC play. Cutter led the contingent of Warrior players in double figures with 9 points in the first half and 8 in the second. Sophomore guard Treyton Owens had 16, including 10 second half points, 6 to start the 4th quarter; junior swingman Nick Sebastiao scored 11 and senior guard Mitchell Prince had 10 points, including 5-6 free throws in the final minute. Rounding out the scoring for the Warriors was senior guard Jimmy Neace with 8 points landing two 3-balls and junior guard Brantley Deaton netting six with strong inside play. "We need to give Clarksville a lot of credit with their game plan," said Scottsburg Head Coach Brent Jameson. "They spread us out and we had trouble guarding them with their quickness, penetration and dribble drive. They are an improved group and well coached. With that said, we still found a way to win. It is a great quality of this Warrior team. Treyton (Owens) made some big plays and was physical the entire game. Hayden (Cutter) fought thru some foul trouble and still found a way to get his points. We did a good job against their press and we limited our turnovers and made our free throws." The game started slowly for both teams with Clarksville taking a 13-12 lead after the first quarter. 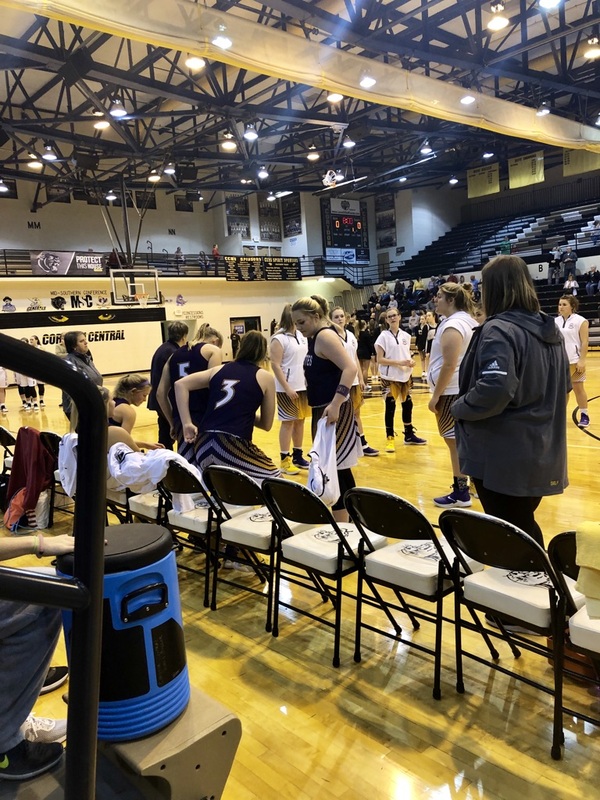 The second quarter had Scottsburg building a 26-21 advantage before the Generals closed the half on a 5-0 run as both teams headed into the intermission at 26-26. The third quarter saw the lead change hands, but a trey by Neace at the 5:40 mark gave the Warriors a 35-33 edge one they would never relinquish. Scottsburg outscored the Generals 17-13 in the stanza to take a 43-39 margin into the final quarter. The 4th quarter opened with six straight points on strong inside play by Owens as Scottsburg led 49-39 with 6:15 to play. The Generals would make a run cutting the Warriors lead to 53-50 with 4:00 to go. But Scottsburg answered with a 8-0 run culminated by a Neace layup with 1:30 to play and the Warriors holding a 61-50 advantage. The final minute was a Warrior parade to the charity stripe as Prince knocked down 5-6 and Cutter was 2-2 as the Clarksville plan was foiled by Scottsburg's marksmanship. Sebastiao had 8 rebounds, 3 assists and 2 blocks, while Owens had seven boards, 3 assists and 2 steals. Deaton had 6 rebounds in the game. Statistically speaking, the Warriors were 22-52 (42.0%) from the field; 3-14 (21.0%) from 3's; 15-21 (71.4%) free throws; 32 rebounds (15 offensive); 11 assists; 8 steals; 5 blocks; 9 turnovers and 12 total fouls. Scottsburg had 7 fast break points; 13 second chance points and 11 points off 14 Clarksville turnovers. The Generals were 21-52 (40.0%) from the field including 5-13 (38.4%) on trifectas; 7-11 (63.6%) free throws; 31 rebounds (15 offensive); 8 assists; 2 blocks; 14 turnovers and 16 fouls. Clarksville had 11 fastbreak points; 14 second chance points and 10 points points off 9 Warrior turnovers. 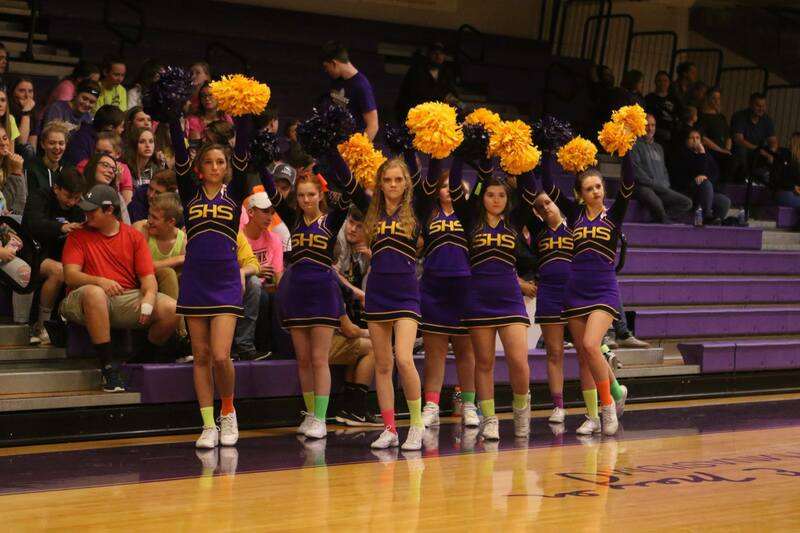 Scottsburg plays a non-conference home game on Saturday, Jan. 20 against 4A Seymour of the Hoosier Hills Conference. The Scottsburg junior varsity defeated Clarksville, 59-40 and is now 9-3 overall. 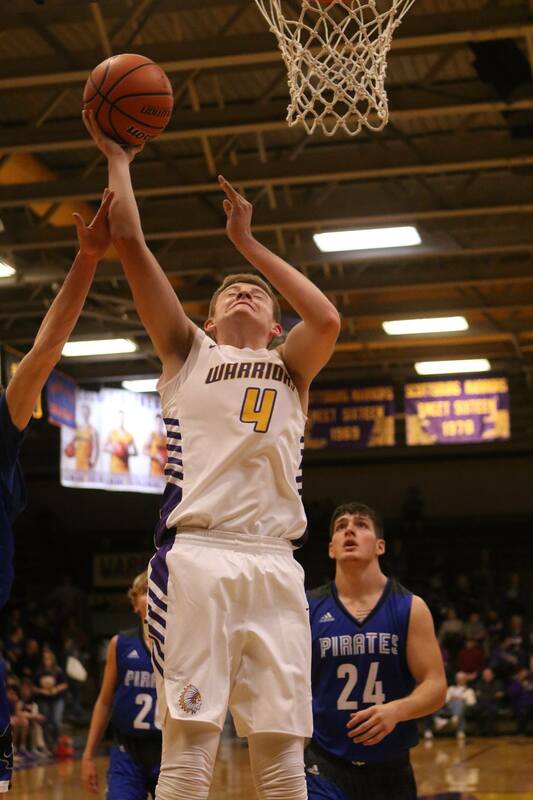 The Scottsburg Warriors basketball team prides itself on the ability to play a relentless pressure defense. But after allowing 21 first quarter points of a non-conference affair against the 4A Seymour Owls of the Hoosier Hills Conference, the Warriors found themselves with much work to do. 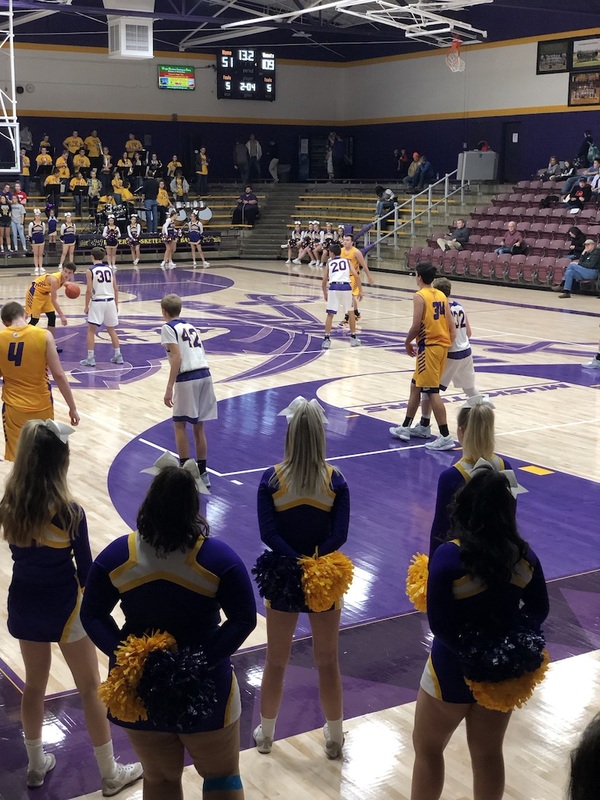 The story had a happy ending for Scottsburg as they allowed just 25 points over the remaining 3 periods, including 6 in the final quarter, to post a 54-46 come from behind victory over the Owls on Saturday (Jan. 19) in historic Meyer Gym. 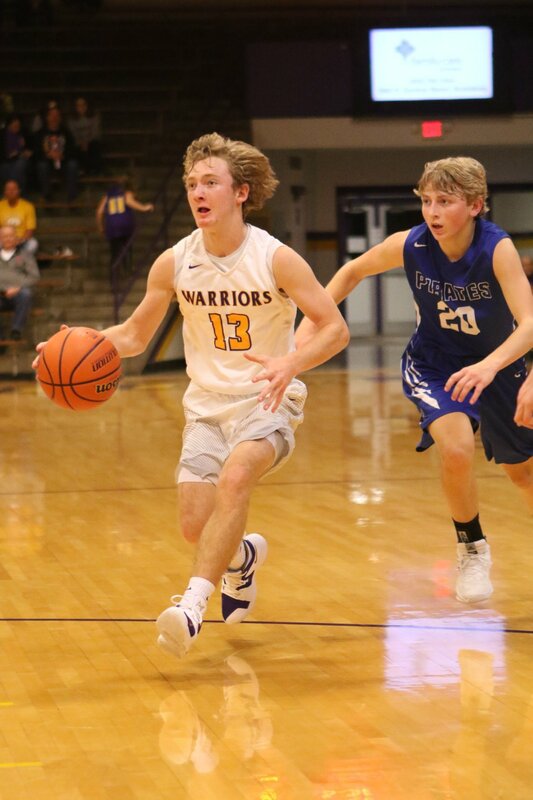 Scottsburg was led by sophomore guard Treyton Owens who had a game high 22 points as the Warriors didn't gain control of the game until early in the final quarter. He was joined by freshman forward Hayden Cutter with 13 and junior swingman Nick Sebastiao with 12. Seymour was led by junior guard Eric McCoy with 9 points, all on 3's early in the first quarter. Junior forward Montana Suits had 8 points for the Owls. The victory moved Scottsburg to 12-3 overall while Seymour dropped to 3-11. "It was another night that we didn't play well to start," said Warrior head coach Brent Jameson. "Our defense broke down giving Seymour some early open looks. Give them credit for a good game plan. They hit several shots early and we made it hard on ourselves. But we found a way to win. We dug ourselves a pretty big hole and fought back. Our pressure was good, especially in the second half. Treyton (Owens) has been so consistent, crashing the glass and defensively with pressure and trapping. There aren't many games you can shoot 12-40 (30.0% ) from the field and win. We need to continue to improve if we are going to be a Sectional contender." Seymour came out of the gates quickly in the first quarter with its 21 points on 5 trifectas to grab a 21-11 lead. The Owls led at one point 13-2 before the Warrior offense got untracked. 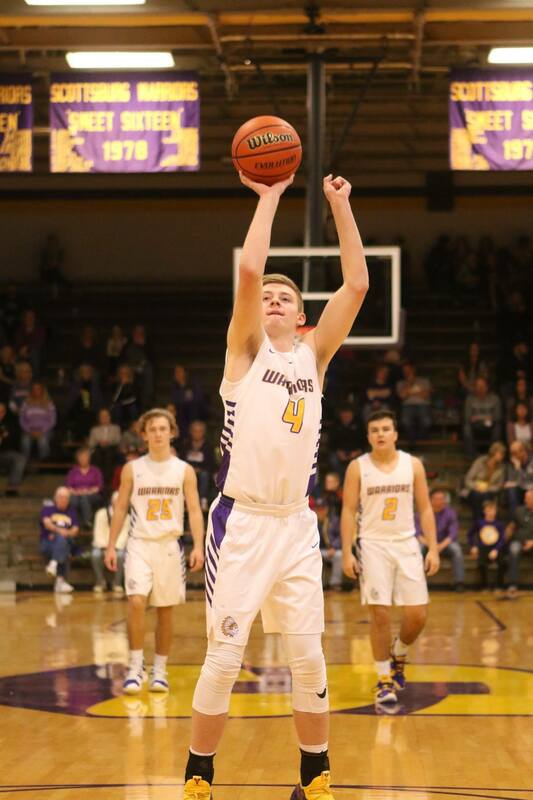 The second quarter started the defensive comeback for Scottsburg as they held the Owls to 10 points on two field goals and six free throws. The Warriors won the stanza 16-10 as Owens paced the team with 10 points, but Seymour still led 31-27 at the break. The third quarter opened with Cutter converting a three point play and Owens scoring to give the Warriors a 32-31 lead with 6:50 to play. Seymour responded with four straight points. Scottsburg went cold from the field and the Owls increased its lead to 6 points at 40-34 to end the quarter. Early in the final quarter Seymour built its lead to 8 points before Cutter made two free throws cutting the Owls lead back to six at 7:21 to play. After Owens was fouled, a technical was assessed to Seymour and turned the games momentum to Scottsburg. Owens hit all four of his free throws and on the ensuing possession Cutter hit two more from the charity stripe to knot the game at 42-42 with 6:24 to play. Owens buried a three-ball off the left wing with 4:35 to go followed by senior guard Jimmy Neace's two pointer to expand the Warrior lead to five points. Seymour would never get closer than three points the remainder of the game as Scottsburg was 11-14 of from the foul line to secure the win. In the final minutes. Scottsburg won the quarter 20-6 limiting Seymour to four free throws and two field goals. Owens finished off his big night in style with 10 points in the quarter, while Cutter had 5 points out of 6 attempts at the line. Owens was 8-10 from the line in the game and added 2 three-balls. Neace had 3 points while senior guard Mitchell Prince and junior forward Brantley Deaton contributed 2 points respectively. Scottsburg won the turnover battle 13-9 with Seymour, but the Owls out rebounded the Warriors 30-23. Seymour had six 3's and was 8-16 from the free throw line. Scottsburg had 4 trifectas and was 24-34 from the line. Next up for Scottsburg is another non-conference clash with 4A Jennings County of the Hoosier Hills Conference on Friday (Jan. 25) in historic Meyer Gym. The Scottsburg Warriorettes for the 2nd straight year have drawn the bye in the IHSAA Girls Basketball Sectional. They will face the winner of the Charlestown/Brownstown Central game. Charlestown is the host site this season for the sectional. Games 1 & 2 will be played on Tuesday, January 29th starting at 6 pm. The semi-final games will be played on Friday, February 1st starting at 6 pm with the Scottsburg v. Charlestown/Brownstown Central game. The Championship game will be played on Saturday, February 2nd at 7 pm. 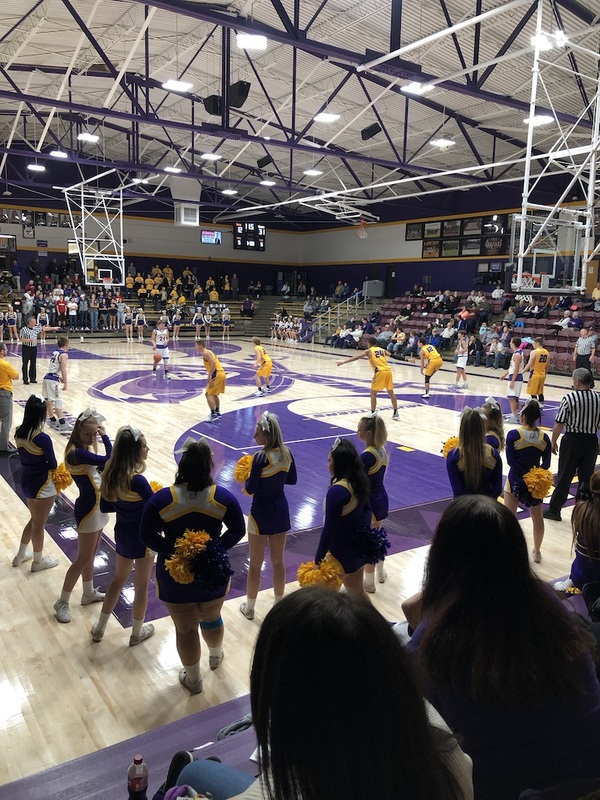 Utilizing a swarming defense while generating scoring opportunities in an effective transition game, the Scottsburg Warriors won their third straight on Friday (Jan. 25) taking a 88-61 non-conference decision over the 4A Jennings County Panthers in historic Meyer Gym. 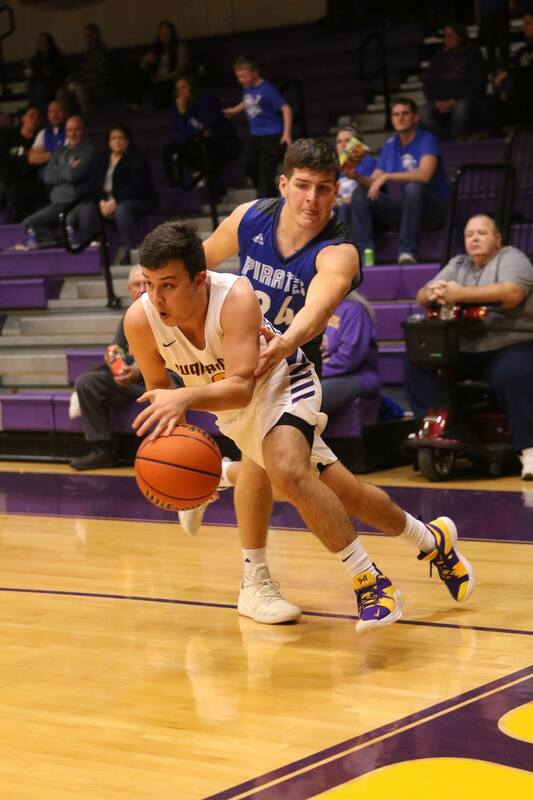 Scottsburg was paced by a pair of 20 point scoring performances as senior guard Mitchell Prince led the way with 26 and sophomore guard Treyton Owens tallied 22. These two Warriors led a scoring onslaught that saw Scottsburg shoot a torrid 31-47 (66.0%) from the field and 6-12 (50.0%) on three-balls. Also scoring in double figures was junior swingman Nick Sebastiao with 14 and freshman forward Hayden Cutter with 11. The Panthers were paced by senior forward Josh Pettit who had 15 points and junior guard Aaron Martin with 11. The win put Scottsburg at 13-3 for the season, its best start in 14 years, while Jennings County of the Hoosier Hills Conference fell to 7-10 overall. "This was our most complete game of season," said Warrior head coach Brent Jameson. "We challenged our guys to put together a complete game and we did tonight. I'm pleased with the way we competed. We were unselfish in a good solid team win. Mitchell (Prince) was so efficient. Treyton (Owens) was great penetrating the ball and scoring while Nick (Sebastiao) effected the game in so many ways besides just scoring. His athleticism, and high motor was apparent on both ends of the floor." Scottsburg scored 26 fastbreak points, including 17 off 16 Panther turnovers. The Warriors only had one first half turnover and had 10 for the game allowing 10 points, and had 16 assists in the win. Jennings County open the game grabbing a 2-0 lead. But three straight buckets by Owens moved the lead back to the Warriors as they would never trail in the game again. Owens would score 12 points in the quarter on six field goals, along with a three by Prince and a couple of free throws by Cutter. Scottsburg would have a 17-10 lead after the first period. But it was the second quarter where the Warriors got its transition game in gear, extending its lead to 21 points and a 44-23 halftime edge. One particular sequence was typical of the Warriors play as Sebastiao blocked a shot in the lane. Junior forward Brantley Deaton saved the ball from going out of bounds on the baseline, passing to Prince who quickly took it up the floor. As the defense converged on Prince in the paint, he found Owens streaking to the basket with a perfect pass for a layup. Owens had six points in the quarter for 18 in the half, while Prince had 9 points, going 6-6 from the free throw line. Sebastiao had 6 points in the stanza. 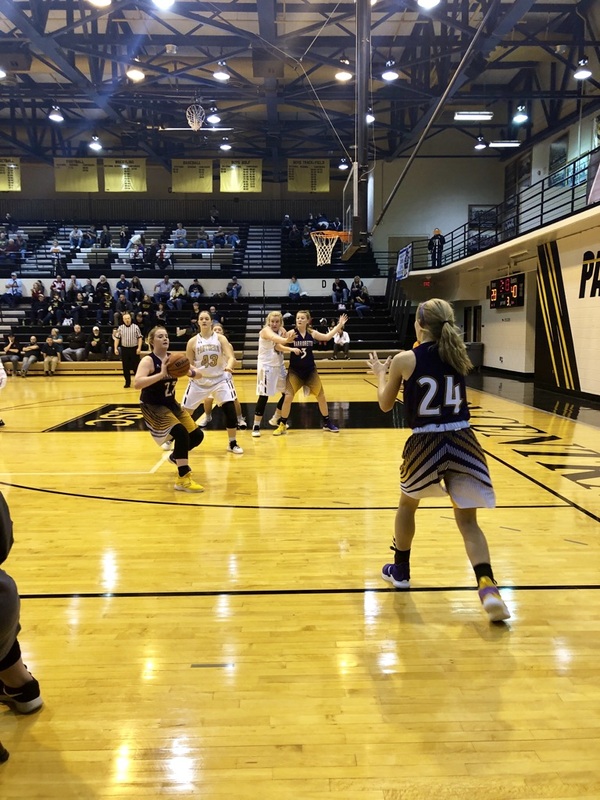 The third quarter saw the Panthers try and get back in the game, playing physical and cutting the Warriors lead to 17 by outscoring Scottsburg 22-18. But the final period started with the Warriors going on a 12-2 run, expanding its lead to 74-48 at the 5:50 mark on a Cutter basket. It gave Scottsburg its largest lead of the game at 26 points. The Warriors would increase its lead to 30 points with just over a minute to play. Scottsburg won the final quarter 26-16 as Sebastiao had 8 points, Prince 7 and Deaton 6. Prince had an impressive stat line going 7-10 from the floor, 5-7 on 3's, 7-8 from the line, 2, rebounds, 2 assists, and 3 steals. Owens was equally as effective hitting 10-13 from the field, 4 rebounds, 4 assists and 4 steals. Sebastiao was a perfect 5-5 on field goals, 1-1 on triefectas and 3-3 from the charity stripe. He added 7 rebounds, 2 assists and 1 blocked shot. The three combined for 22-28 from the floor, including 6-8 from the arch and 12-15 from the charity stripe, 13 rebounds, 8 assists and 7 steals. Cutter had 5 rebounds and 4 assists to his 11 points. Deaton scored 9 points, adding 2 rebounds, 1 assist and a steal, while senior guard Jimmy Neace and sophomore guard Noah Smith chipped in 4 and 2 points respectively. Senior guard Patrick Lincoln had 4 rebounds, 2 assists and a steal. The next Warrior game is another non-conference contest with Switzerland County at home Thursday (Jan. 31) in historic Meyer Gym. 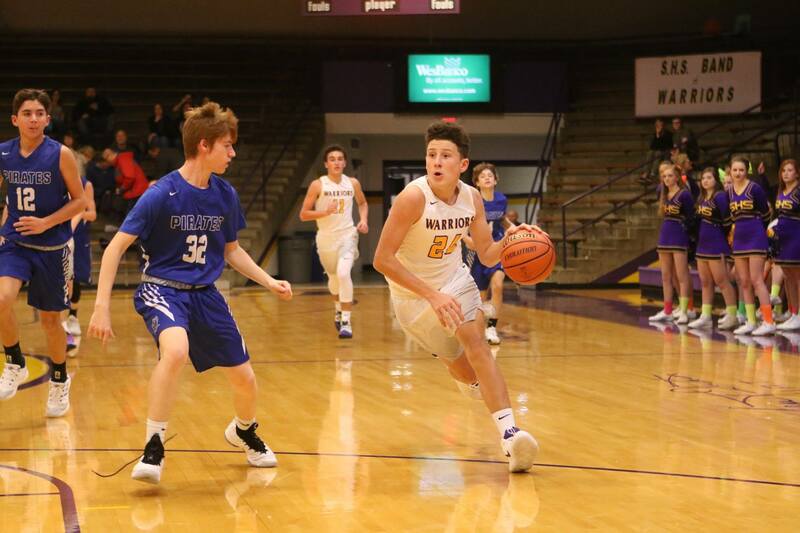 Warrior Hoop Notes: The Scottsburg junior varsity team, directed by coach Dustin Marshall, improved its record to 10-3, with a 55-48 victory over Jennings County. 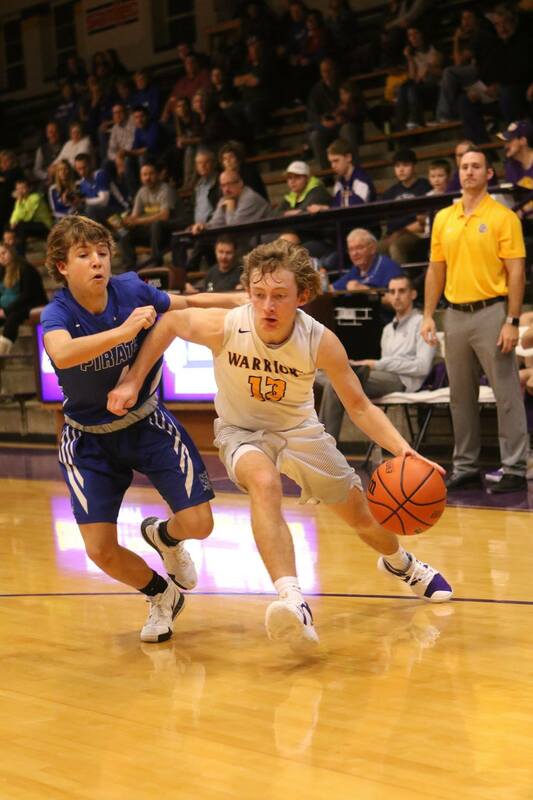 Despite a last minute rally and a game high 24 points by freshman forward Hayden Cutter, the Scottsburg Warriors couldn't catch the visiting 2A Switzerland County Pacers, dropping a 52-51 decision in a non-conference game Thursday night at historic Meyer Gym. The loss moved Scottsburg to 13-4 overall and improved Switzerland County of the Ohio River Valley Conference to 5-13. 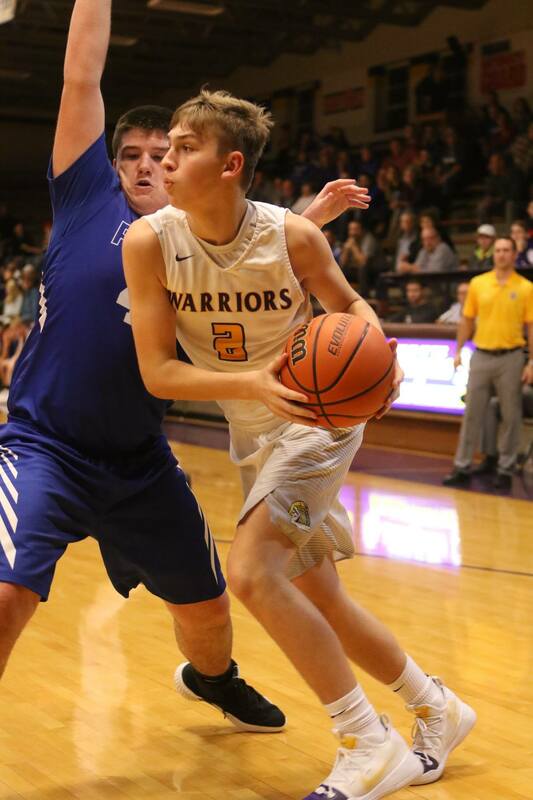 Warrior senior guard Jimmy Neace added 14 points including three 3-pointers for Scottsburg. The Pacers were led by junior guard Damian Breeck with 15 points. He was joined in double figures by forwards Tyler Konkle with 13 and Zach Weaver with 10 points respectively. "Give Coach Dennis and his team a lot of credit. They played well, exposed our weaknesses, took away strengths and had a great game plan," said Warrior head coach Brent Jameson. "Our guys didn't come ready to compete and that falls on me. Our opponents got every loose ball, and played harder while we were a step late. They out hustled us, and as a team that was the disappointing factor. Our players are hurting. But we won't let one game define us. I'm confident we'll bounce back and be ready to go against West Washington." Scottsburg led 39-36 heading into the 4th quarter. After scoring four straight by Cutter on a 3 point play, and one of two technical foul free throws by sophomore guard Treyton Owens, the Warriors had its biggest lead of the game, 43-36 with 7:45 to play. The Pacers then scored seven straight points to tie at 43 with 5:25 remaining. Switzerland County would hit a 3-ball to grab a 46-43 lead at 4:55, a lead they would never relinquish, and expanded their advantage to 48-43 with just under 4 minutes to play. Junior forward Brantley Deaton and Cutter scored four straight points to get Scottsburg back to 48-47 near the 2:00 mark. The Pacers answered with four straight points to hold a 52-47 lead with 55-seconds to play. The tense final minute of had Neace hitting a 3-ball with 38-seconds to go pulling the Warriors to 52-50. Scottsburg then fouled putting the Pacers on the free throw line where they missed the front end of a one-and-one with 20.8 seconds to play. The Warriors grabbed the rebound went back up the floor, couldn't score, and took a time out at 4.2 seconds. Coach Jameson set up an inside play for Cutter and the freshman was fouled in the act of shooting with 2.2 seconds remaining. Cutter made the first free throw to ur the Pacers lead to 52-51. Switzerland County then called a timeout prior to his second attempt. Cutter rimmed out the following free throw as the Warriors were forced to foul on the rebound. The Pacers missed the front end of another 1-and-1 and Scottsburg, with .3 seconds to play, had a chance for a catch and shoot beyond half court 3 ball by Jimmy Neace. The shot bounced high off the back board as the horn sounded. Statistically, the game was quite even but for one essential category. . .rebounding. The visiting Pacers out boarded the Warriors by a 32-21 margin, including 13 offensive rebounds for 11 crucial second chance points. Scottsburg was never able to get its transition offense started. Cutter was 10-17 from the field, had 2 rebounds, 3 blocked shots, 2 assists and a steal for the game. Neace was 5-9 from the floor with 3 rebounds. Senior guard Patrick Lincoln had 4 points, 4 rebounds one assist and steal as a starter. Owens also had 4 points, 3 rebounds, 2 assists and 2 steals. Senior guard Mitchell Prince had 3 points, 2 rebounds, 3 assists and 2 steals, while Deaton scored 2 points, had 3 rebounds, 2 assists and a steal. The Warriors got some outstanding minutes from sophomore guards Noah Smith with 3 assists and 1 rebound, and Alex Witt who had 2 assists and 1 rebound. Next up for Scottsburg is another non conference game on Saturday (Feb.2) against the 1A West Washington Senators of the Patoka Lake Conference. 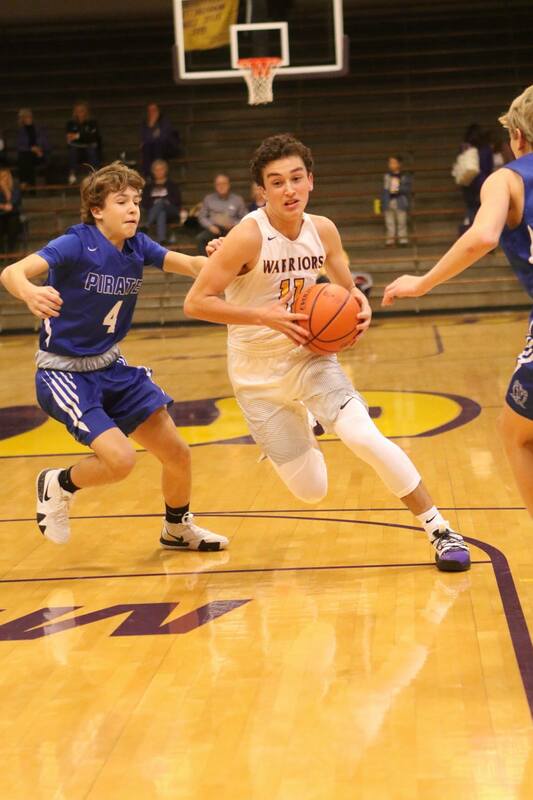 Warrior Notes: The Scottsburg junior varsity moved to 11-3 overall with a 55-34 win over Switzerland County for coach Dustin Marshall. . .Junior swingman Nick Sebastiao did not play against the Pacers but was expected back against West Washington on Saturday (Feb. 2). 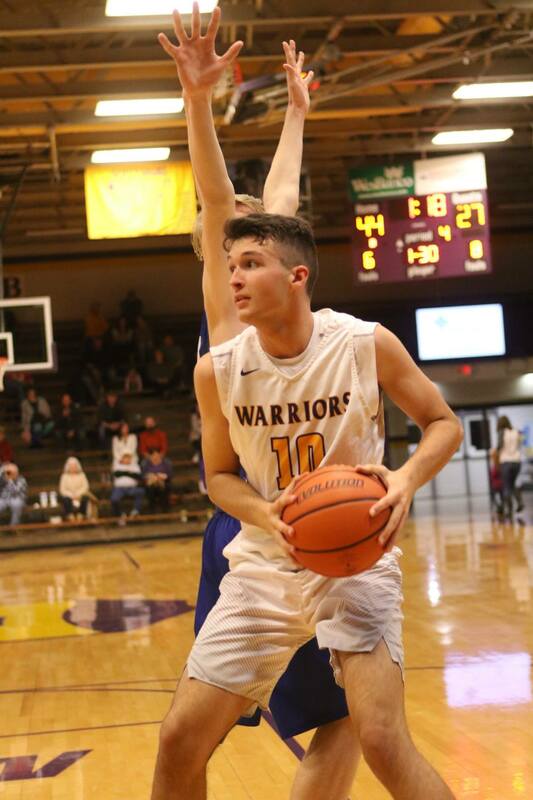 Using a balanced scoring attack led by Mitchell Prince's team and game high 17 points, the Scottsburg Warriors withstood a furious third quarter rally in posting a 60-44 home non conference win over the 1A West Washington Senators on Saturday (Feb. 2) in historic Meyer Gym. The victory moves Scottsburg to 14-4 on the season, while West Washington of the Patoka Lake Conference drops to 6-12. "It was a nice bounce back game for our kids. I thought we really competed from start to finish and that was important to our players," said Scottsburg head mentor Brent Jameson. "Give our guys credit. They answered the bell today when we challenged them. Mitchell (Prince) was really solid all around. Jimmy (Neace), Nick (Sebastiao) and Patrick (Lincoln) did things that don't show up in the box score. The same for Noah (Smith) in the first half. Again, a team win with effort predicated on our defense which is our formula for success." Defense was the key in this victory as they limited West Washington to 31% from the floor and 30% on 3's while winning the battle of the boards 35-26. Prince, a senior guard, came out hot scoring 8 points to open the contest. In the game he recorded three 3-pointers and was 6-6 from the free throw line. Joining him in double figures were freshman forward Hayden Cutter notching 14 points, 7 rebounds, 3 blocks and 2 assists, along with and sophomore guard Treyton Owens with a "double-double" on 10 points and 10 rebounds to go with 2 assists. The Senators were led by Holden Bowsman, a sophomore guard, who scored 13, and was joined in double figures by teammates Jake Strange and Kaden Abels with 12 and 10 points respectively. West Washington scored the first basket of the game and it would be the only time the Senators would hold a lead. The Warriors would build a 6 point margin throughout quarter. 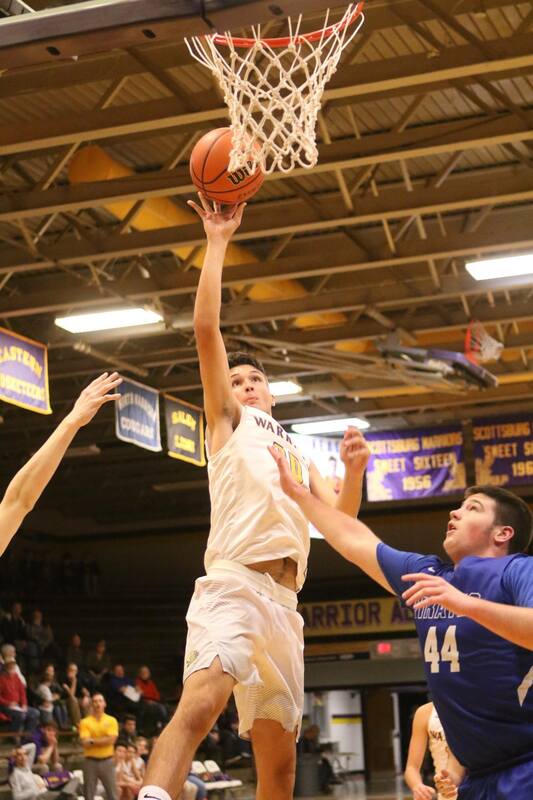 A Prince lay up at the buzzer gave Scottsburg a 17-11 advantage after the opening period. The second quarter saw Scottsburg expand its lead to 13 as Owens drained a 3-ball giving the Warriors a 31-18 margin at the 2:15 mark. Owens added another bucket and Prince made two free throws in the waning seconds of the quarter to give Scottsburg its largest lead of 14 (35-21) heading into halftime. Owens had 7 points to pace the Warriors in the stanza. West Washington opened the 3rd quarter on an 8-1 run to cut Scottsburg's lead to 36-29. But Owens drained a long 3-pointer getting the margin back to 10 at 39-29 with 3:45 to play. The Senators then reeled off 7 straight points to pull within three, 39-36, with just under two minutes to go. Scottsburg counter punched with a 6-0 spurt as junior forward Nick Sebastiao had a basket and senior guard Jimmy Neace scored twice, the final points coming on a lay up as the buzzer sounded. The run put Scottsburg ahead by 9 points, 45-36, as the Senators outscored them 15-10 in the quarter. The final period showed the Warriors continuing its run from the third quarter, sprinting to a 9-2 edge on an inside bucket and one of two free throws by Cutter along with a pair of trifectas by Prince and junior forward Brantley Deaton. Midway thru the final period the Warriors had increased its lead back to 16 points at 54-38, and were never pressed the remainder of the game. Scottsburg took the quarter 15-8 as Cutter and Prince scored 5 each. Rounding out the scoring for the Warriors were Neace with 6 points, 3 rebounds, 2 assists and a steal; Sebastiao with 6 points, 5 rebounds, 4 assists and a block; Deaton with 5 points, 3 rebounds and 1 assist; and senior guard Patrick Lincoln with 2 points, 3 rebounds and 1 assist. Guard Noah Smith had a rebound and an assist. Scottsburg was 22% (22-49) from the field; 32% (6-19) on 3's; 71% (10-14) on free throws; 35 rebounds (13 offensive); 13 assists; 3 steals; and 4 blocked shots. The Warriors had 10 fastbreak points; 7 second chance points; and scored 16 points off 14 Senator turnovers. 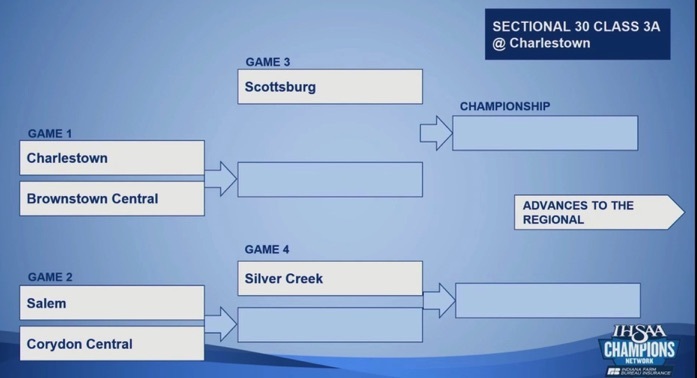 Next up for Scottsburg is a Mid Southern Conference game at Silver Creek on Friday (Feb. 8). It is the final Conference game of the regular season for the Warriors and a stretch where they will play four of their next five games on the road. Warrior Notes: The Scottsburg junior varsity, coached by Dustin Marshall, defeated West Washington, 60-42, to raise its record to 12-3. Silver Creek showed why it is among the top ranked teams in Indiana High School basketball as the Dragons posted an 81-54 home Mid-Southern Conference victory over the Scottsburg Warriors on Friday (Feb. 8). The win moved the Silver Creek to 16-3 overall and 6-1 in MSC games. The loss dropped Scottsburg to 14-5 overall and 6-3 in MSC affairs. It was the last regular season conference game for the Warriors. Silver Creek had just six players score in the game, but two scored 20 while three others also registered in double figures. Combine 55 points in the paint by the Dragons as Scottsburg struggled from the field and you have a recipe for a loss. The Dragons were paced by senior 6-6 forward Jack Hawkins with 21 points; senior guard Zane Gross with 20; 6-6 sophomore forward Kooper Jacobi who had 14; senior guard Ty Kessinger with 13; and sophomore guard Trey Kaufman notching 11. The Warriors also had six players score, led by sophomore guard Treyton Owens who tallied 13 points; junior forward Nick Sebastiao had 12; senior guard Jimmy Neace 10; senior guard Mitchell Prince with 8; freshman forward Hayden Cutter seven and junior forward Brantley Deaton with 4 points. "We ran into a really good team," said third year head Warrior mentor Brent Jameson. "To beat a complete team your margin for error is slim. You have to make shots...we got great looks but shots didn't go down and that's the difference in the game. Our team has to bounce back quickly as we play at the No. 12 2A team in Paoli followed by the No. 1 2A team in Southwestern." 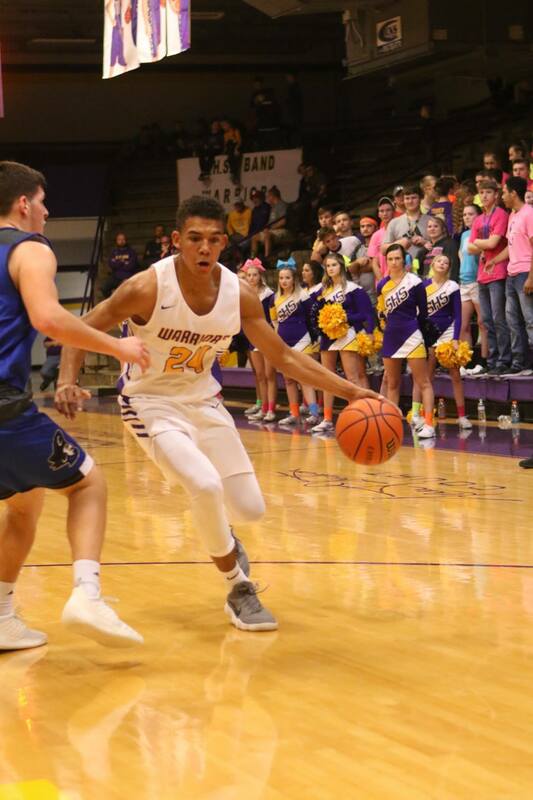 Scottsburg opened the game on a positive note with a long corner three ball by Prince, but the Dragons would respond with nine straight points and never trail again. During that time Cutter picked up two quick fouls and at the 6:10 mark was on the bench for the remainder of the quarter. Silver Creek had its biggest lead at 21-8 with 1:45 to play. But Sebastiao would drain a 3, cutting the margin back to 10 points. Silver Creek would score again to push the advantage back to 12 points at 23-11 as the period ended. Sebastiao would have 6 points in the quarter. The second quarter was evenly played by both teams with Scottsburg getting to within 8 points after Cutter made a pair of free throws with 4:35 to play. But the Warriors would never be that close again as Silver Creek took a 14 point margin into the half, leading 39-25, after a 16-14 edge in the period. Neace had 8 points for Scottsburg including two trifectas. Early in the third quarter Scottsburg would get the margin back to 12 as Owens and Sebastiao combined for 10 points early on. But the Warriors would draw no closer as Silver Creek outscored the visitors 21-17 in the period for a 60-42 lead. Owens scored 9 points in the period while Sebastiao had four. Gross had 10 points for Silver Creek. The final period belonged to Silver Creek as they outscored Scottsburg 21-12 with their lead swelling to the final margin of 27 points. A bright spot in the second half was Owens scoring 11 of his Warrior game high 13 points pacing the Warrior offense. Silver Creek had 5 three-pointers, was 14-20 from the free throw line and committed 12 turnovers. The Warriors had 6 trifectas, while making 14-17 from the charity stripe and committed 12 miscues. The Warrrior junior varsity lost to Silver Creek, 70-47. Scottsburg is now 12-4 overall for coach Dustin Marshall. Next up for Scottsburg is a non-league match up at 2A Paoli of the Patoka Lake Conference on Tuesday (Feb. 12). 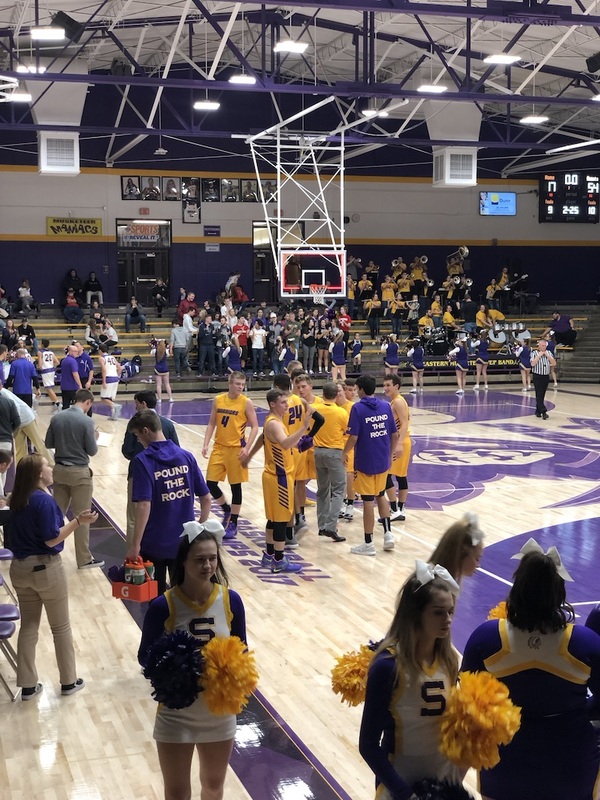 The Scottsburg Warriors had been in come back mode all game long, but when the Paoli Rams converted on a 17-foot jumper with 1.8 seconds to play, they simply ran out of time in dropping a 58-56 non-conference road game Tuesday (Feb. 12). A second straight loss puts Scottsburg at 14-6 on the season while the No. 12 ranked 2A Rams of the Patoka Lake Conference moved to 17-3 overall. The Warriors may look back at this game and lament the fact they had several opportunities slip away in the first half. Cold shooting and 11 turnovers had Scottsburg trailing 24-17 at the intermission as Paoli seemed to have the Warriors out of sync. But the second half would see the Warriors erupt for 39 points, coming back from an 11 point deficit to get within one point and eventually grabbing a one point lead in the final quarter. "Disappointing loss. One of our worst games of the year, " said Scottsburg head coach Brent Jameson. "Our mistakes were self inflicted. . .rebounds, turnovers, missed assignments and not being fundamentally sound. Give Paoli credit for making plays when they had to. It was good to see us battle back from a double digit deficit. Even with how poorly we played we still had a chance to win. That speaks to the potential of this team. Jimmy (Neace) made a ton of plays and showed the will to win being fearless in the moment. Mitchell (Prince) was our leader on the defensive end and while not having a big scoring game still made a big contribution. He showed his growth and maturity as a senior leader." Scottsburg was led in scoring by senior Neace with 17 points, including 12 in the second half. He had two 3-balls, four rebounds, three assists, a steal and a block. Neace was joined in scoring honors by freshman forward Hayden Cutter with 11, including nine in the second half. Sophomore guard Treyton Owens also recovered from a quiet first two quarters by totaling 10 points with nine in the final stanzas and added eight boards and three assists. Junior Nick Sebastiao had nine points and 11 rebounds with four assists and two steals, while senior Prince pitched in five points and three assists, along with junior Brantley Deaton's four points and two rebounds. While the Warriors shot 52% from the field and out rebounded Paoli, they eventually could not over come 18 turnovers converted into 15 points by the opportunistic Rams. Paoli was paced by Brett Bosley with 17 points and Ashton Minton with 15. 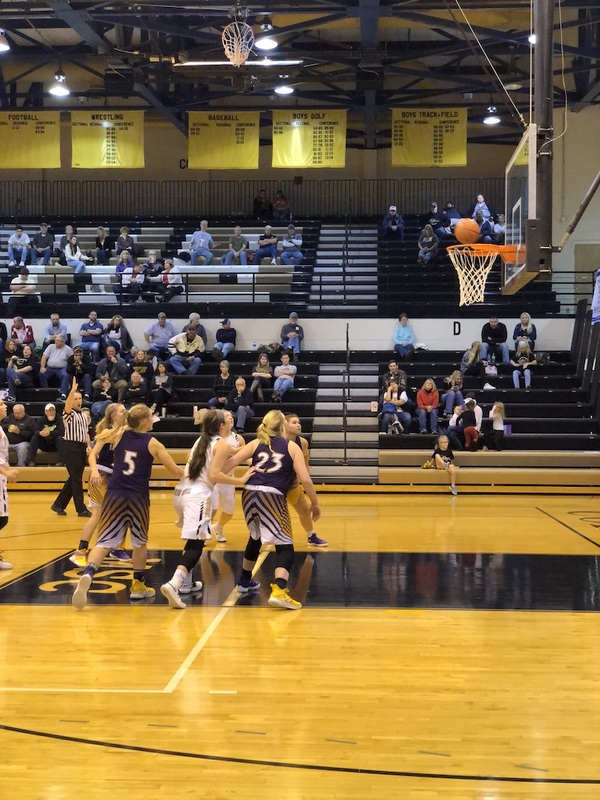 The second half was a game of runs by both teams as Scottsburg open the third quarter going on an 11-5 spurt to cut Paoli's lead to 29-28 after Sabastio 's three point play. The Rams answered with nine straight points to build the lead back to 10. That was expanded to an 11 point margin before a nine point deficit faced the Warriors at the end of the 3rd quarter. Scottsburg opened the final period with a 10 point run fueled by Cutters five points, along with a 3-ball by Neace and a bucket by Owens giving Scottsburg its first lead at 45-44. A pair of free throws with just over six minutes to play gave the Rams a 46-45 advantage. It was the start of another Paoli run as they scored the next five straight points as Scottsburg ended the breakaway with a Cutter basket and the Warriors trailing 52-47. Paoli answered again going up by seven at 54-47 with over three minutes to play. Scottsburg still had life as Neace hit a huge triefecta, but the Rams responded with a deuce to push the lead to 56-50. Then in just over 90-seconds, the Scottsburg offense got six straight points from buckets by Owens, Cutter and Sebastiao combined with a solid pressure defense to tie the game with under two minutes to play. Paoli held the ball for the final 1:45 until the Rams drove to the basket and missed a heavily contested shot. A loose ball rebound was captured by Parker Sullivan who hit the game winner at 1.8 seconds to play. After a Paoli timeout Scottsburg was not able to get off a final shot. Scottsburg was 23-44 (52%) from the field; 4-13 (31%) on 3's; 6-10 (60%) free throws; 30 rebounds (9 offensive); 14 assists; 6 steals; 1 block; 18 turnovers and 13 fouls. The Warriors had 13 fastbreak points; 10 second chance points; and 9 points off turnovers. Paoli was 24-53 (45%) from the field; 2-14 (14%) on 3's; 8-14 (57%) free throws; 25 rebounds (12 offensive); 15 assists; 9 steals; 4 blocks; 10 turnovers; and 10 fouls. The Rams had 4 fastbreak points; 13 second chance points; and 15 points off, turnovers. The Paoli junior varsity defeated Scottsburg, 55-52 in the preliminary game. The Warriors are now 12-5 overall for coach Dustin Marshall. Next up for Scottsburg is another non-league game at 2A powerhouse Southwestern (Hanover) on Saturday (Feb. 16). The Southwestern-Hanover Rebels used a 14-2 fourth quarter run to pull away in a tightly contested game, taking a 67-55 non-conference win over the visiting Scottsburg Warriors on Saturday (Feb. 16). The win was the 12th straight for the Rebels, moving their overall record to 21-1. The 2A champions of the Ohio Valley Conference are ranked No. 1 in the Indiana 2A rankings. The loss, the third straight for the Warriors, moved them to 14-7 overall with two regular season non-league games remaining prior to Sectional play. Turnovers, a lopsided opponent advantage from the free throw line and a tough shooting night from the field spelled doom for the Warriors on this night. Scottsburg lost the turnover battle to the Rebels by a 19-9 count, but more importantly allowed 23 points off those miscues. Southwestern outpointed Scottsburg 15-3 from the free throw line for the game, 11 coming in the first half. The Warriors had ample scoring opportunities throughout but could only convert 38% from the field, while shooting a solid 40% from the three point line. Scottsburg owned the boards on this night by a 41-30 margin. "The game came down to too many turnovers and not getting our inside play going as we anticipated," said Scottsburg head coach Brent Jameson. "We had good looks on 3's but didn't finish well inside. We played well enough defensively to give us a chance to win. Southwestern is a tough match up. There is a reason why they are ranked as the No. 1 team in 2A. We scored only five points in our transition game as they took that away. Our team hasn't faced a ton of adversity, but having lost three straight and four of five we have the opportunity to show we can handle it by not pointing fingers. This next week we have the chance to get some momentum back to see how far we have come this season. It's really easy to be a great teammate when there is no adversity, but the true measure of a team is when things don't go your way. That's a life lesson for these young men. The challenge becomes can we stick together and move forward when things haven't gone our way? We need to use this as a learning tool." Scottsburg led 14-11 after the first quarter but Southwestern would open the second period on an 11-0 run when senior guard Jimmy Neace drained a 3-ball at the 4:46 mark. The Rebels led 22-17 as the Warriors would put together a brief 9-4 spurt on two more trifectas by Neace and buckets by sophomore guard Treyton Owens and junior forward Brantley Deaton to tie the game at 26. Southwestern would take a 28-26 lead into the intermission, making 11 of 15 free throws in the half. Senior guard Mitchell Prince opened the third quarter for the Warriors hitting two quick trifectas as the game was tied at 32 with 6:45 to go. The Rebels used a 9-3 run to go ahead 41-35 with 2:00 remaining. Southwestern would outscore the Warriors 10-8 the remainder of the stanza as Neace added two more 3's and junior Nick Sebastiao had a score. All told Scottsburg was outscored by a 23-17 margin in the quarter and trailed 51-43. The fourth quarter had a promising start for the Warriors as freshman Hayden Cutter had an inside score while Prince made a 3-pointer to cut the Rebels lead to just three at 51-48 with 6:20 to play. But Southwestern would put on its 14-2 dagger run using a mixture of transition points and 3's to extend its lead to 65-50. Prince stopped the onslaught with his fifth three-pointer of the game at the 2:19 mark, but the damage had been done. The teams would exchange baskets the rest of the way as the Rebels won the quarter 16-12. The Warriors were led in the scoring column by Prince with 15 points, all on 3's, as he added 5 assists, and 3 rebounds. He was joined by Neace with 12 points (all, on 3's) 4 assists, a steal, 2 rebounds and a blocked shot. Owens had 10 points, to go with 9 rebounds and a steal, followed by Cutter with seven points and 10 rebounds; Sebastiao with five points, 11 rebounds, a steal and block; senior Patrick Lincoln with three points and a rebound; and Deaton added three points and three rebounds. Southwestern had Tyler Kramer with a game high 22 points, followed by Foster Medford with 19 and Matthew Williams with 14. Scottsburg was 21-56 (38%) on field goals; 10-25 (40%) on 3's; 3-8 (38%) on free throws; 41 rebounds (15 offensive); 13 assists; 3 steals; 2 blocks; 5 fast break points; 15 fouls; 17 second chance points; and 10 points off turnovers. Southwestern was 23-55 (42%) on field goals; 6-20 (30%) on 3's; 15-20 (75%) on free throws; 30 rebounds (9 offensive); 18 assists; 11 steals; 1 block; 14 fastbreak points; 8 fouls; 12 second chance points; and 23 points off turnovers. The Warrior junior varsity registered a 41-33 win over Southwestern and is now 13-4 overall for coach Dustin Marshall. Next up for Scottsburg is 1A Borden of the Southern Conference on Feb.19 in a non-league affair. It will be Warrior "Senior Night" at historic Meyer Gym. 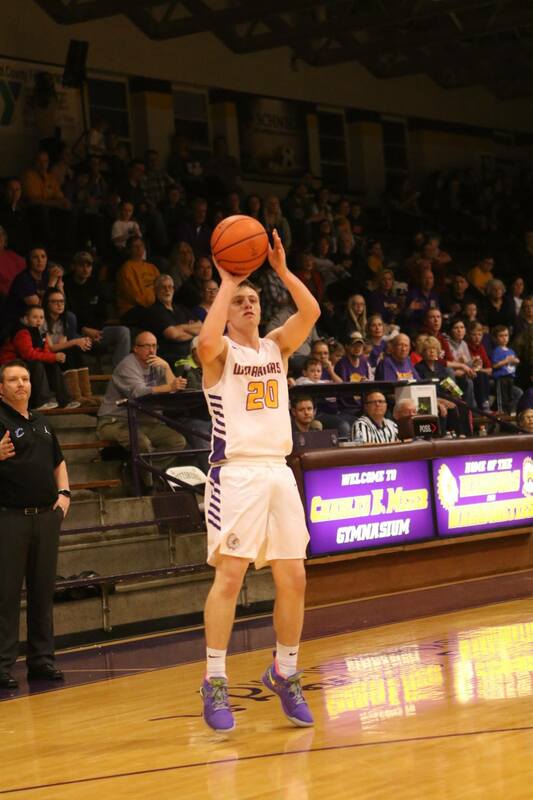 Led by senior Mitchell Prince's 26 points, the Scottsburg Warriors connected on 13 three pointers to make "Senior Night" a joyous occasion, posting a 77-26 win over the Borden Braves on Tuesday (Feb. 19) at historic Meyer Gym. The win moves the Warriors to 15-7 overall while the loss dropped the 1A Braves of the Southern Conference to 3-19. In the final home game of the season, the Warrior faithful said goodbye to four special seniors; three players and a team manager, who worked on the famous "Pressure Cooker" floor for the last time as students. The senior players combined for 38 points as Prince made 8 trifectas and was joined by Jimmy Neace with nine points on three, 3-balls. Patrick Lincoln scored on a three point play, with a strong inside move and free throw, after blocking a shot and starting a fast break at the other end. Destany Self, a senior team manager, has been with the Warrior program four years, the last three with current Scottsburg head mentor Brent Jameson. All four of these individuals have been instrumental in their own special way to help to build the current Warrior program on and off the court and will be greatly missed. Five other Warriors hit the scoring column in the win as freshman Hayden Cutter and junior Nick Sebastiao had 13 points respectively. Sophomore guard Treyton Owens scored 9 points while junior Brantley Deaton and sophomore Noah Smith each had 2 points. "It was a fantastic night," said Jameson. "It was fun to see our seniors play with joy, and the rest of our team share that experience on this special night. These four seniors have been a huge part of our success and each will have a special place in my heart. 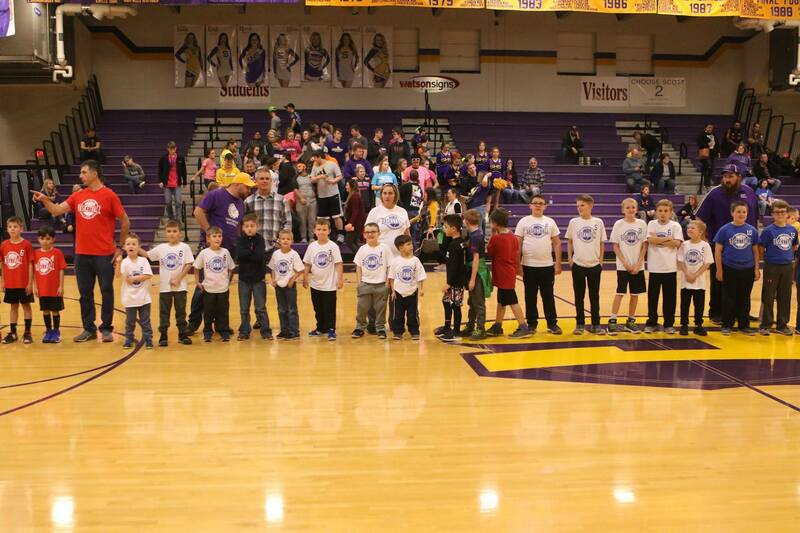 Part of their legacy is bringing back the winning tradition of Scottsburg Warrior basketball." The Warriors dominated every statistical category in this game, especially in the rebounding and turnover departments. Scottsburg forced 17 Braves turnovers netting 16 points off those miscues, while committing just eight. The Warriors out boarded Borden 34-18 with 22 second chance and 13 transition points. Combine those numbers with 51% shooting from the field with 43% from behind the arc on those 13 trifectas and you have the ingredients for a big win. Borden opened the scoring with a pair of free throws for its only lead of the game as Scottsburg jumped out to a commanding 21-6 lead after the opening quarter. Much of the scoring came from behind the arc as Scottsburg had 5 trifectas with four by Prince in the last 2:45 and one by Neace. The second quarter had the Warriors dominating on the defensive end allowing the Braves one basket in the stanza. Prince added three additional 3-balls while Neace also hit another. Scottsburg outscored Borden 19-2 in the quarter to lead 40-8 at the intermission. A 27-10 run by the Warriors in the third featured strong inside play from Cutter, Sebastiao, Deaton and Lincoln. The Warriors would add four more 3's by Prince, as Owens, Neace and Sebastiao also contributed behind the arc to put the game tally at 13, and a 67-18 lead thru three quarters. The fourth quarter scoring slowed as Scottsburg had a 10-8 advantage to end the game with no additional three pointers. The Warriors scored 14 two-pointers; 13 three's; and 10 free throws in a balanced attack for the night. Individually, Prince added two steals, assists and blocks to his stat line, while Sebastiao had seven rebounds and a block, going 4-6 from the floor and 4-4 at the line. Cutter grabbed eight caroms to go with an assist and steal hitting 5-8 from the floor and 3-3 at the line. Neace had a active game adding five rebounds, three assists, two steals and a block. Owens added a game high seven assists and zero turnovers to go along with three rebounds. Lincoln had six rebounds and one assist, steal and block. Deaton added three rebounds, three steals and an assist for his night. The Warrior JV team, under the direction of Dustin Marshall, moved its record to 14-3 with a 51-19 win over Borden. Next up for Scottsburg is the final game of the regular season prior to Sectional play on Friday (Feb. 22) at 2A Mitchell, 12-9 overall, of the Patoka Lake Conference. 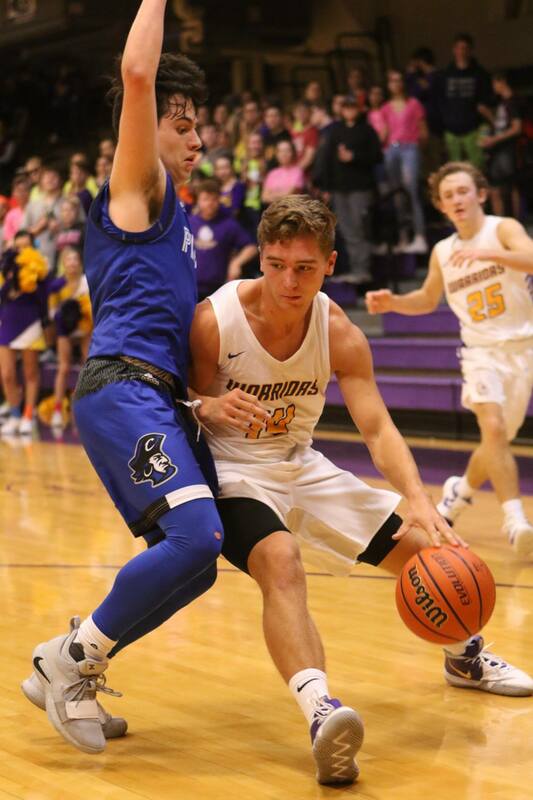 The Scottsburg Warriors let a 17-point third quarter lead slip away as they dropped a 66-63 non-league road contest to the Mitchell Bluejackets on Friday (Feb. 22). The final regular season game setback puts Scottsburg at 15-8 overall while the 2A Bluejackets of the Patoka Lake Conference improved to 13-9. Next up for Scottsburg is IHSAA 3A Sectional play on Feb. 27 against Salem at Charlestown High School. Mitchell senior guard Tyson James led all scorers with 23 points including three, 3-pointers, as the Bluejackets used a pressure defense and torrid free throw shooting in the second half to earn the come from behind victory. Scottsburg was paced by sophomore guard Treyton Owens with 18 points, seven rebounds and one assist while junior forward Brantley Deaton scored 15, all on 3-balls. He also recorded three rebounds , three assists and a block. Freshman forward Hayden Cutter also had 15 points, with eight rebounds, three assists and a block. Junior forward Nick Sebastiao scored nine points and added six rebounds, two assists, three steals and a block. Senior guard Jimmy Neace and Patrick Lincoln had four and two points respectively to round out the Warriors scoring on this night. Neace had four rebounds, three assists and a block, while Lincoln had two assists. Senior guard Mitchell Prince added one rebound, two assists and two steals. "We played a tremendous first half and missed some opportunities to go up even more," said third year Warrior head coach Brent Jameson. "Give Mitchell credit as they hit some tough shots. Too many mental mistakes defensively for us and missed inside shots in the second half. Our free throw shooting hurt us and when the game got close we played not to lose or got reckless. That is a recipe for a loss. We have lost close games and won close games. The transition from a good to great team is the great team finds a way to win those close games. We now face the most important part of our season. Our team will go back to work and get ready to play Salem." This affair was a tale of two distinct half's of play. The first belonged to Scottsburg in one of its best defensive performances of the season forcing turnovers and taking a 36-21 advantage into the intermission. The Warriors dominated the game during this time as Cutter had 13 points; Deaton posted nine and Owens contributed eight points. The game started slowly and was tied 9-9 at the 3:45 mark of the first period. 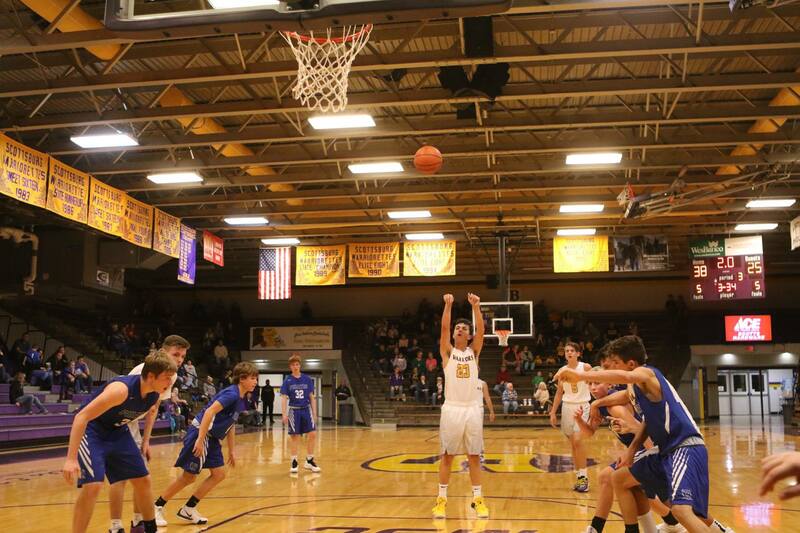 Scottsburg would close the quarter on a 6-0 run behind consecutive 3's by Deaton, who also brought the ball up court for his team against Mitchell's man-to-man full court pressure frequently during the game. The Warriors would slowly increase its lead to 15 in the second quarter and take a comfortable margin into the break. But the second half was all Bluejackets as Mitchell outscored the Warriors 45-27. The third quarter opened with a Neace basket putting the Warriors ahead 17 at 38-21. But from the 6:32 mark until 3:55 remained the Bluejackets would score 11 unanswered points, cutting the Warriors lead to six at 38-32. An Owens bucket stopped the run and put Scottsburg back up by eight, 40-32. The quarter saw the Warriors increase its lead by as many as 10 points after another Deaton trifecta with 2:15 to go. A three ball and three-point play got the Bluejackets within six at 48-42 at quarters end. Mitchell dominated by outscoring the Warriors 21-12 in the stanza to get back in the game and set up its fourth quarter come back. Mitchell opened the final period with a 5-0 mini run getting within a point at 48-47 with 6:31 to play. Scottsburg took a timeout to regroup. The game then had the Warriors hold a two to four point edge over the next few minutes. When Cutter scored inside and Owens converted on a driving lay in, the Warrior lead was six at 61-55 with under 3:00 to play. The momentum seemed to shift back to Scottsburg. But Mitchell would then quickly score seven straight points, five from the free throw line, as it grabbed a 62-61 advantage with 1:34 remaining. Neace was fouled on a drive and would connect with a pair of free throws with 1:02 to go putting Scottsburg back on top, 63-62. It would be the final points scored by the Warriors. Mitchell had four points, two off an inbounds play and two free throws in the final 32 seconds to grab the lead and complete the game scoring, 66-63. With 12.1 seconds remaining the Warriors were still alive and facing full court pressure went the length of the floor needing a three to tie. Mitchell defended the perimeter well and Cutter's heavily guarded desperation 3-pointer at the buzzer bounced off the glass. Scottsburg was 21-54 (39%) field goals; 6-17 (35%) 3's; 15-24 (65%) free throws; 35 rebounds (14 offense); 16 assists; 6 steals; 4 blocks; 13 turnovers; 18 fouls; 3 fastbreak points; 5 second chance points; 11 points off opponents turnovers. rebounds (7 offense); 13 assists; 10 steals; 2 blocks; 14 turnovers; 15 fouls; 9 fastbreak points; 2 second chance points; 18 points off opponent turnovers. 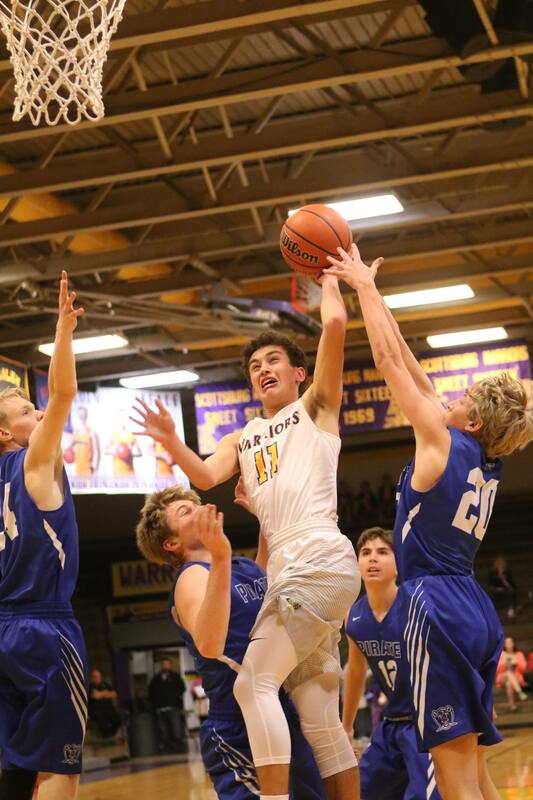 The Scottsburg Warrior junior varsity posted a 48-45 win over Mitchell in the preliminary game to raise its record to 16-5 under the direction of coach Dustin Marshall. 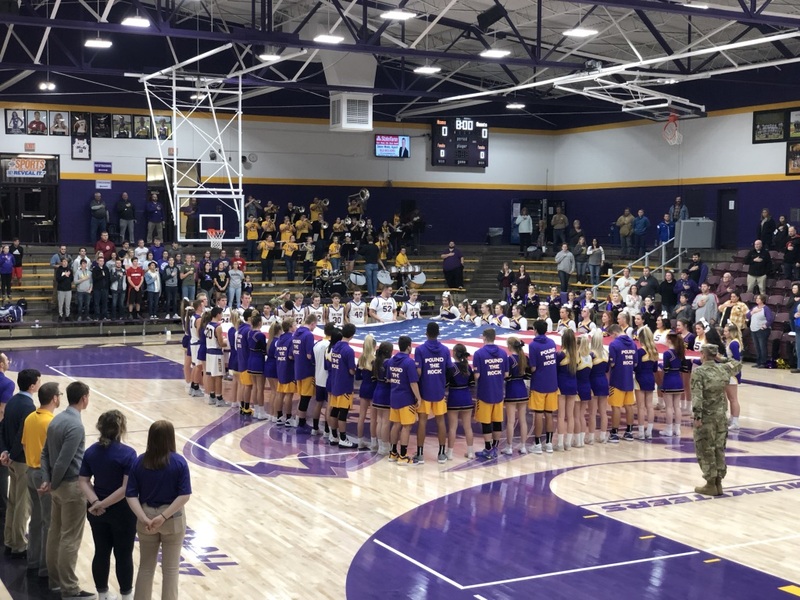 Missed scoring opportunities late and a 21-7 deficit in free throws made spelled doom for the Scottsburg Warriors as the Salem Lions took a 59-55 victory in the quarterfinals of the IHSAA Sectional 30 play at Charlestown High School on Wednesday (Feb 27). The loss ended Scottsburg's season at 15-9, while the Lions improved to 14-10 and a semifinal matchup with Corydon Central on Friday (Mar. 1). 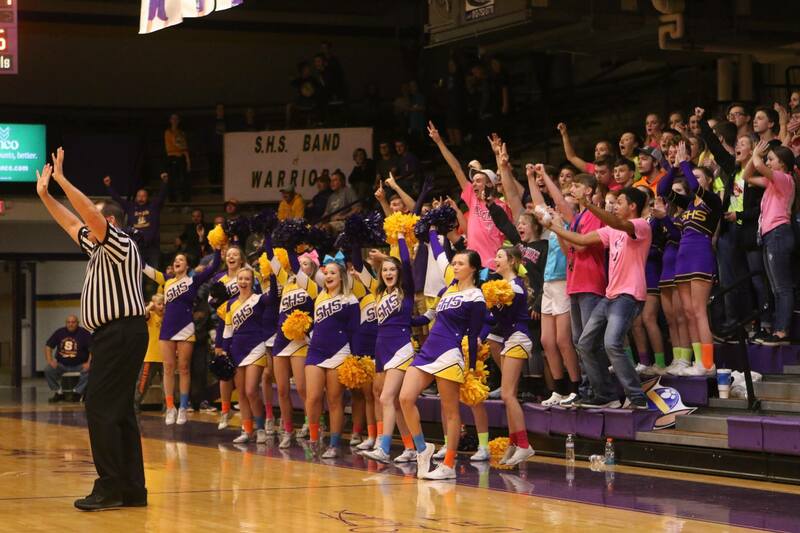 The Lions victory avenged a 73-49 Scottsburg win on the Warriors home court back on Jan. 11. Scottsburg had a tough ending to its season dropping six of eight games, with four of those Warrior losses coming by a total of 10 points. Landon Suvak led the Lions and all scorers with 19 points including four 3-pointers. The Warriors were paced by a pair of 14 point performances from freshman Hayden Cutter and sophomore Treyton Owens. Junior Nick Sebastiao had 13 and junior Brantley Deaton added nine points. Senior Jimmy Neace rounded out the Warriors scoring with five points. "Disappointing ending obviously," said Scottsburg third year head coach Brent Jameson. "We felt if we play our style we have a great chance to win. Give Salem credit, they made plays. Our team didn't finish possessions well enough. In the third and fourth quarter Salem took the shots we wanted them to to take but didn't come up with enough rebounds or loose balls. Statistically it could have been better for us in some areas, but it was fairly even. The game was lost at the line. It is what it is." The Warriors led 14-12 after the first quarter and increased the lead to seven on an Owens 3-ball just under the 6:00 mark of the second period at 20-13. Salem would end the half on a 14-5 run, including two trifectas, one at the buzzer, to go into the intermission with a 27-25 advantage. The Lions would win the quarter 15-11 and have five 3-pointers in the half. The third quarter had the Warriors grabbing the lead 34-33 at the 4:30 mark on a strong inside look by Sebastiao. Scottsburg increased that lead to five points, 38-33, with just over 3:00 remaining with a free throw by Sebastiao and a bucket by Cutter. Salem would outscore the Warriors 9-4 the remainder of the quarter as both teams were deadlocked at 42-42. Cutter had eight points, Owens five and Sebastiao four in the period. The final quarter saw Salem start fast and go on an 8-2 run to grab a six point lead near the 5:00 minute mark. The Warriors would get back to within two points at 50-48 with 3:55 to play on a Sebastiao bucket. The Lions pushed the lead to 54-49 with 1:58 to go before Owens scored at 1:15 to pull the Warriors within three points at 54-51. A timeout by Scottsburg to set their defense worked as they forced a turnover, but could not convert on offense. After empty Scottsburg possessions Salem then scored on three of four free throws increasing its lead to 57-51 with under 20 seconds to play. The Lions would add two more free throws while Deaton would close out the scoring with four points. Sebastiao had seven points in a strong quarter. All told Salem was 15-22 from the charity stripe in the second half while Scottsburg was 5-6. Cutter, who fouled out, had six rebounds and four assists while shooting 6-11 from the floor. Owens was 6-15 from the field, had five rebounds, three steals and two 3-balls. Sebastiao was 5-9 from the floor, had nine rebounds, three assists, one block and four steals. Deaton was credited with a three ball, five rebounds, two assists and one block. Neace had two rebounds, two assists and two steals. Senior Mitchell Prince had one rebound and three assists, while senior Patrick Lincoln had a rebound. 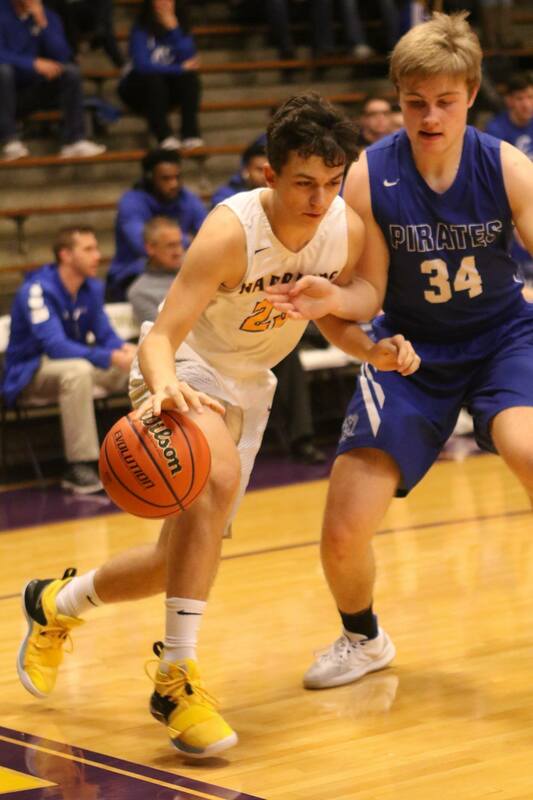 Scottsburg was 22-55 (40%) on FGs; 4-18 (22%) on 3's; 7-10 (70%) on FTs; 33 rebounds (16 offensive); 14 assists; 9 steals; 2 blocked shots; 16 turnovers; 21 fouls; 12 fastbreak points; 6 second chance points: 13 points off 16 opponent turnovers. Salem was 15-42 (36%) on FGs; 8-20 (40%) on 3's; 21-32 (66%) on FTs; 32 rebounds (13 offensive); 10 assists; 10 steals; 3 blocked shots; 16 turnovers; 11 fouls; 1 fastbreak point; 10 second chance points; 17 points off 16 opponent turnovers. Under Jameson's direction, the Warriors final 15-9 record was an eight game improvement over last seasons 7-18 mark. The win total of 15 was also more than the Warriors had combined over the past two campaigns (7-18 in 2017-18 and 5-19 in 2016-17). The Warriors were third with a 6-3 record in the Mid-Southern Conference. The future is bright for Warrior basketball with a talented group of experienced varsity players returning along with a junior varsity squad that posted a 15-5 mark. The dedicated assistant coaches Kevin Owens, Dustin Marshall and Jacob Dunn accomplished much with this Warrior team. "When we have a chance to reflect on this season and look where our program has been in the past, we will realize this was a huge turnaround," Jameson said. 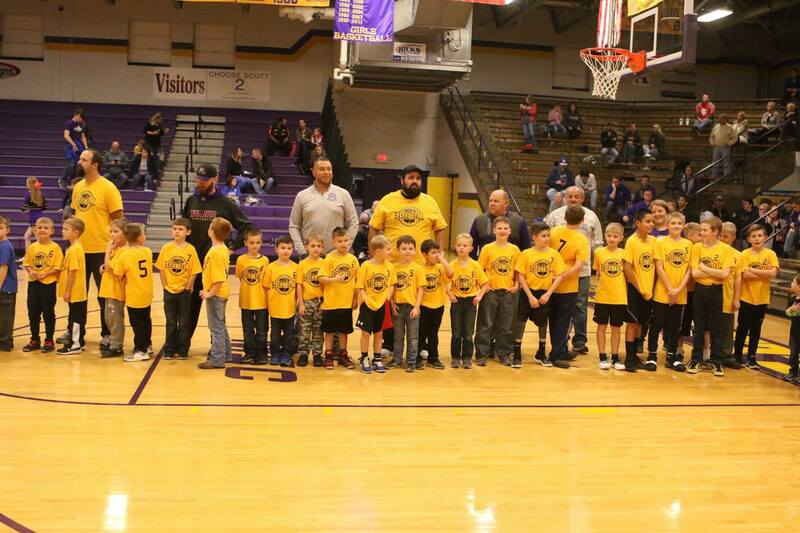 "With the group returning Scottsburg basketball is back in the conversation. Our team gets the opportunity to keep building off this season and continue to improve. Proud of our seniors (Patrick Lincoln, Mitchell Prince, Jimmy Neace). Each one has meant a great deal to the program, while starting at the lowest of lows. They won more games this year then in their previous three seasons combined and left a huge impact on Scottsburg Warrior basketball."